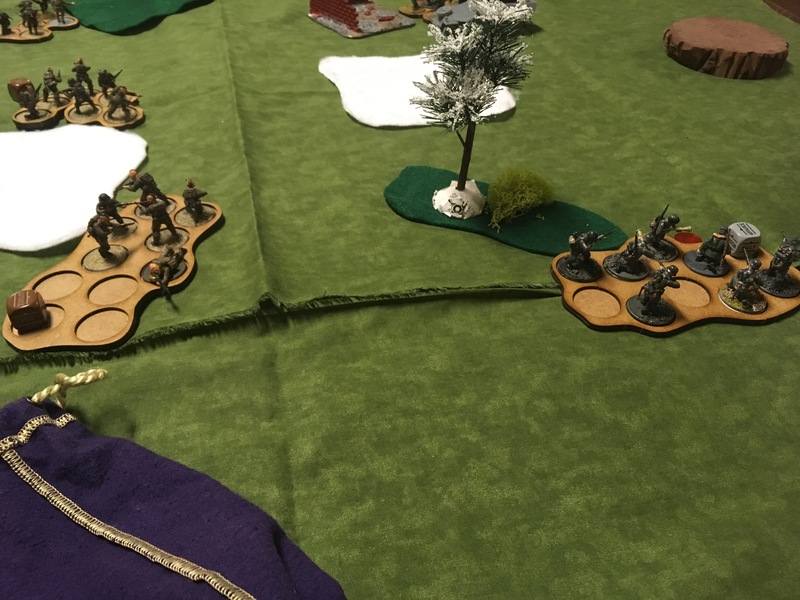 The NY/NJ Bolt Action escalation league continued at the Schenectady Wargamers Association with another Bolt Action day. 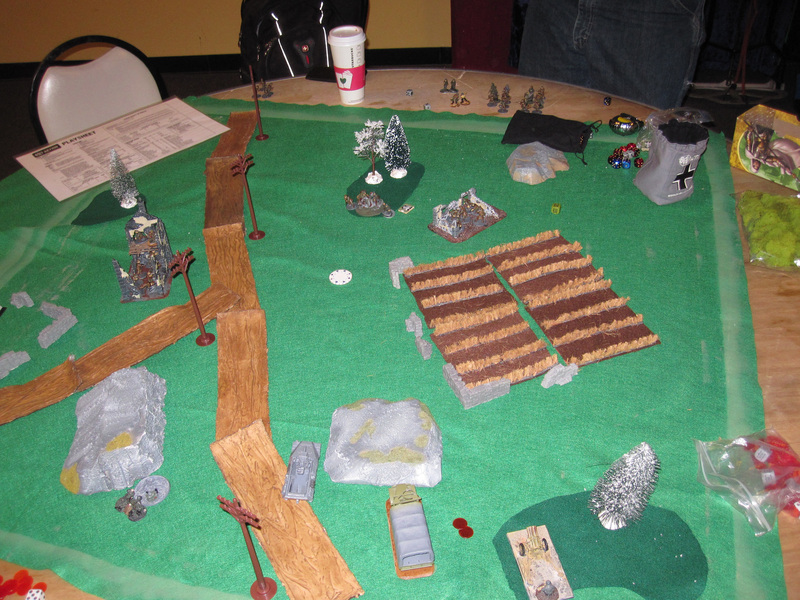 We set up three tables and had five players come by for a day of gaming. 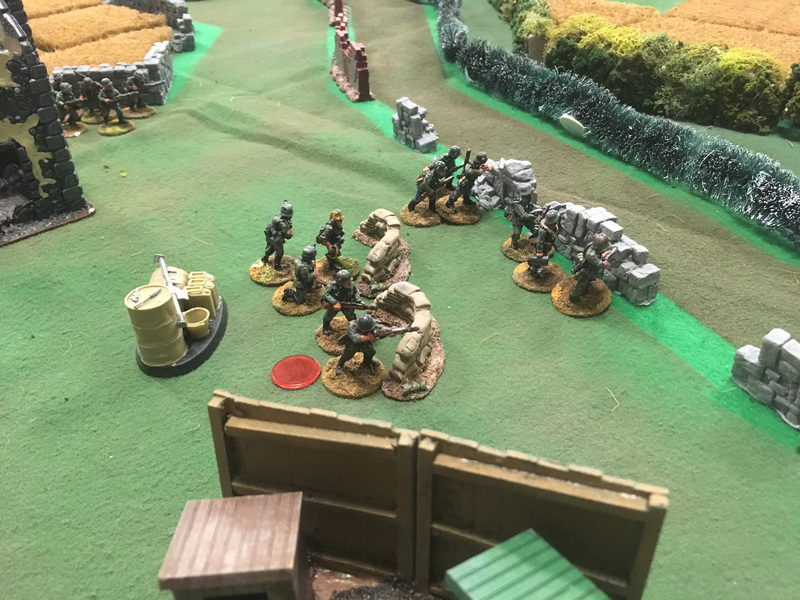 I’ve been trying off and on to get a Bolt Action community going in the area for a couple of years now with little success. 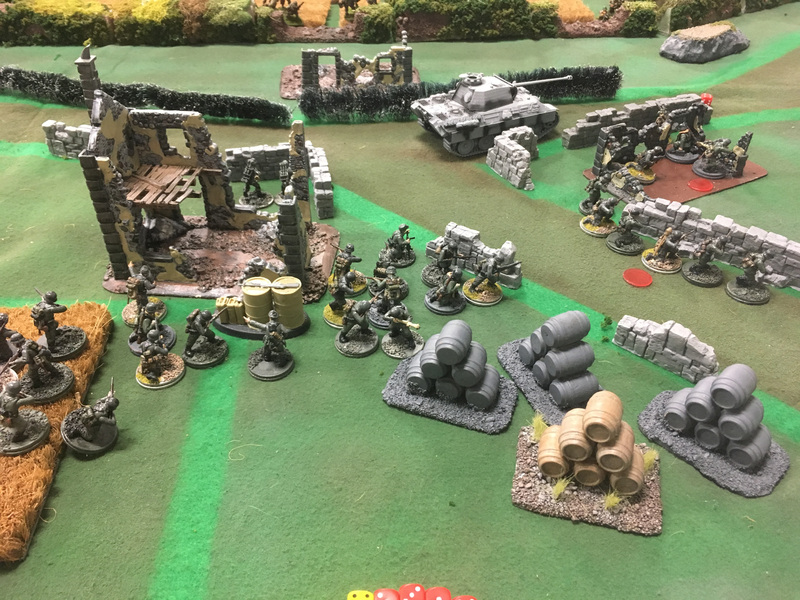 A new game store opened in Perth (Guardian Games) and they had a fist full of players actively playing at the same time we announced the joint NY/NJ escalation league and several of them jumped at the chance to join! This combined with the 4-5 other players in the area who are interested have given us the critical mass to get this off the ground! 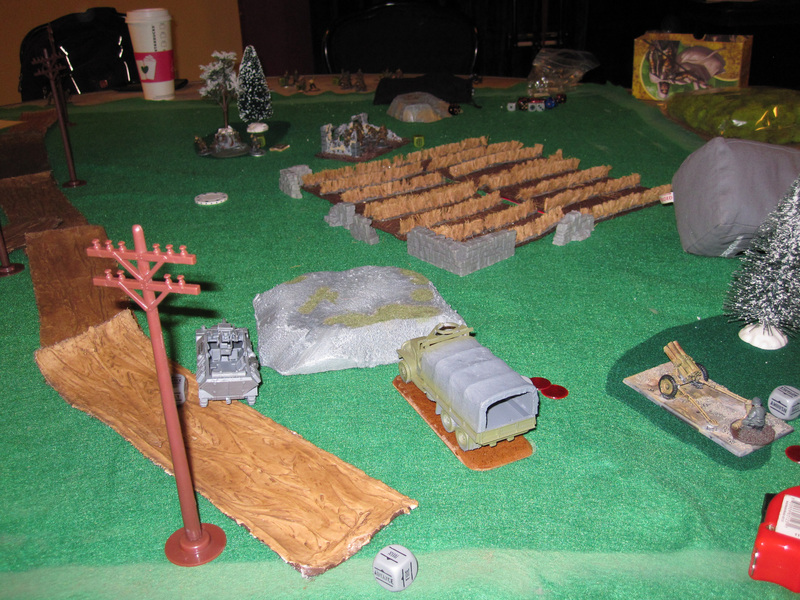 Th league continued into month 2 with 750 point single platoon lists on 4×4 tables. 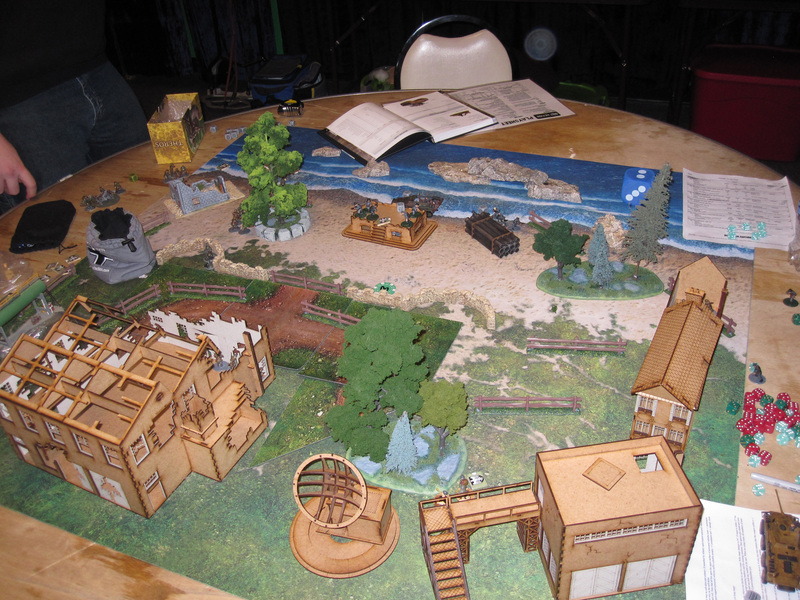 Me and my friend Murph have been busy buying and making more terrain, but keeping the tables at 4×4 certainly helped us fill them up. 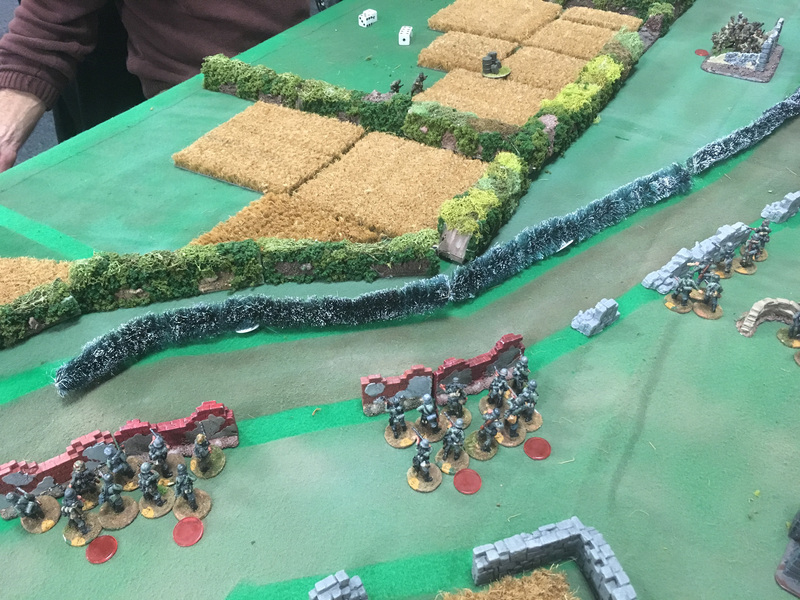 We’re confident that we will be able to fill 4×6 tables by next month and we’re looking forward to fielding 1000 point armies full of toys to play with! 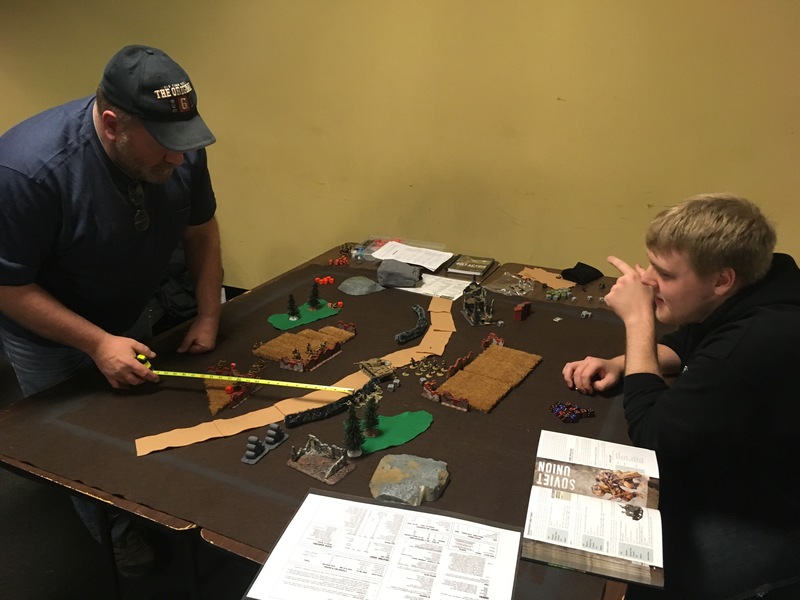 We initially put together 3 tables, with Bruce from Guardian Games bringing some of his own terrain to fill out a fourth table with a factory setup that’s going to look awesome once painted. 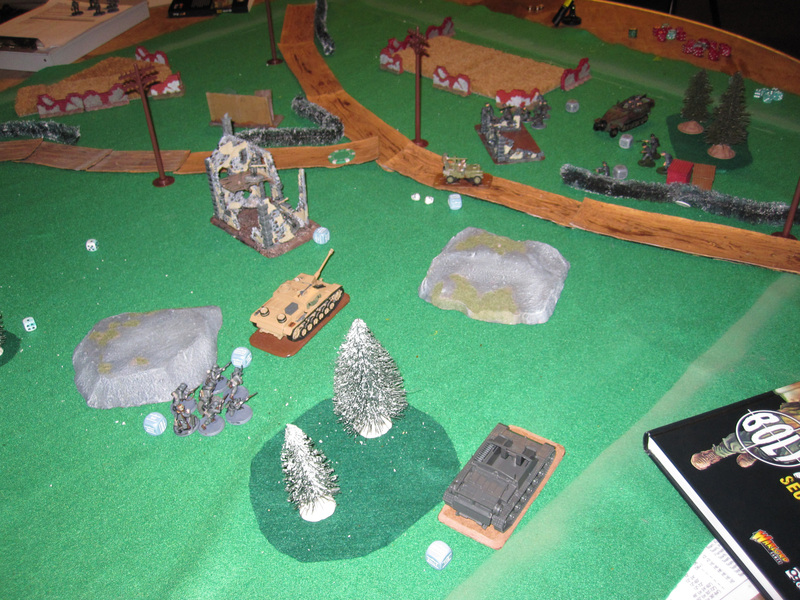 We had four different German forces and one American force. 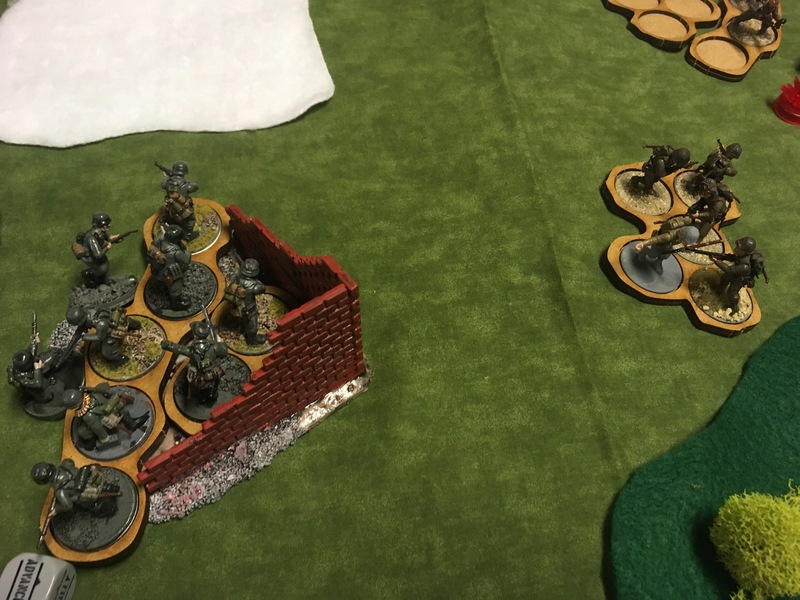 I unfortunately lost two games and won only one. 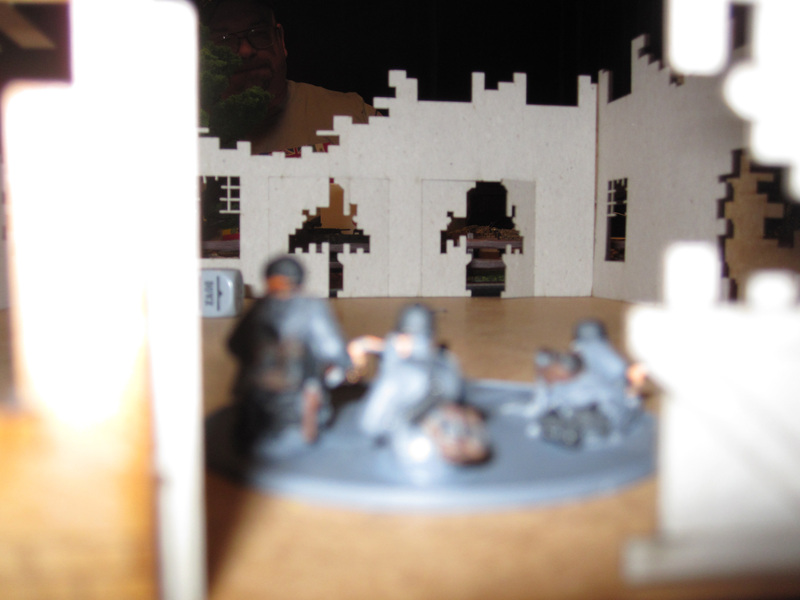 I narrowly missed drawing one game due to figure placement. 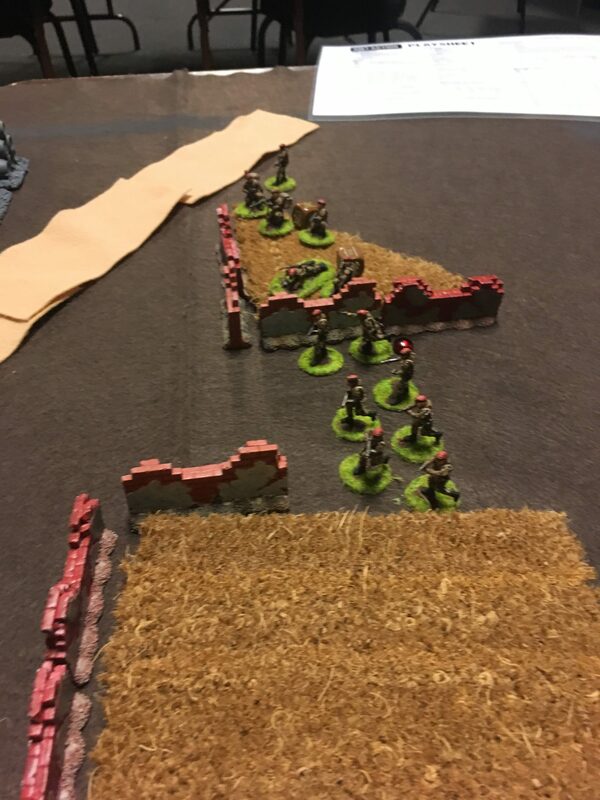 I had to be 3 inches from the objective and I was 3.5, my opponent took a very hard fought win with American and German dead scattered around the battlefield. 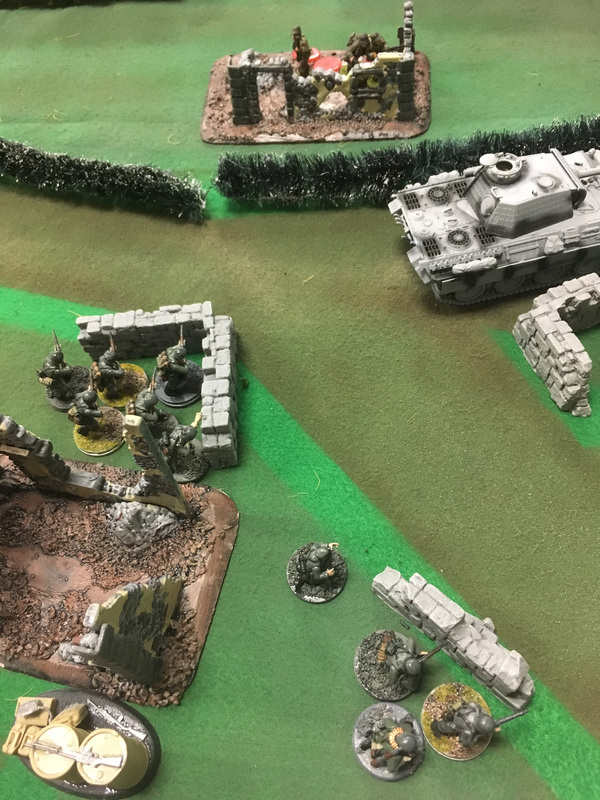 The highlight of that game was my Nebelwerfer hitting twice, one hitting two units directly and splashing damage onto a third squad of airborne TWICE, dealing four casualties and FIVE pins to them. That squad never recovered and was eliminated on the next round. 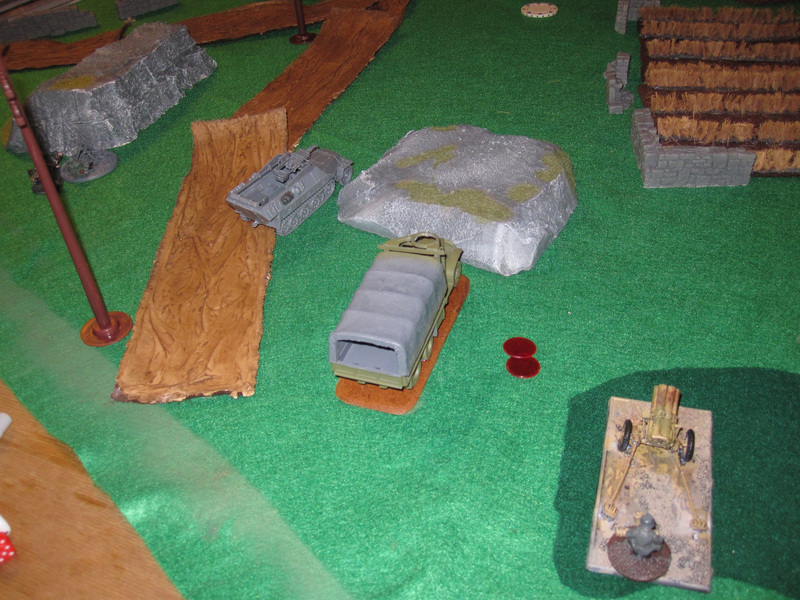 My nebelwerfer also managed to nail a sniper team that was positioned to take the objective. 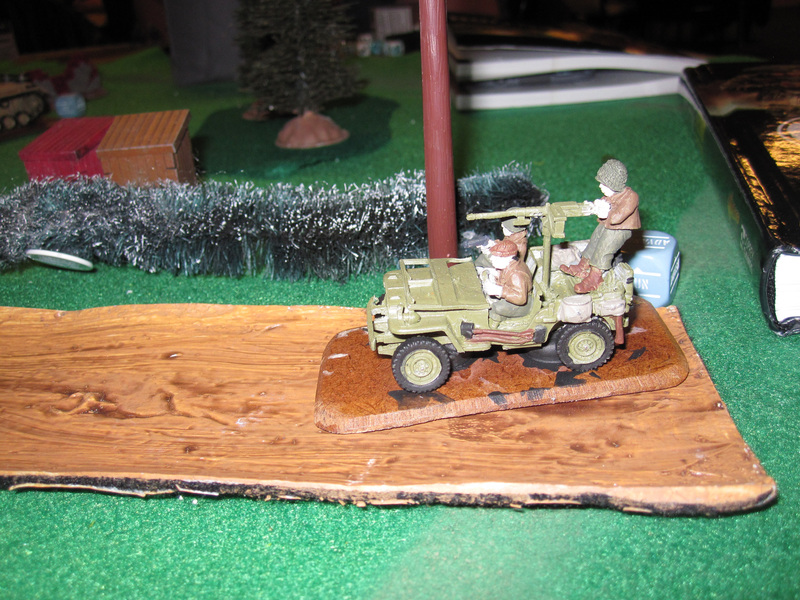 Runner up to that was three rounds of a .50 cal armed jeep and a bazooka team firing away at a kubelwagon at point blank range and either missing or failing to do any real damage to it. 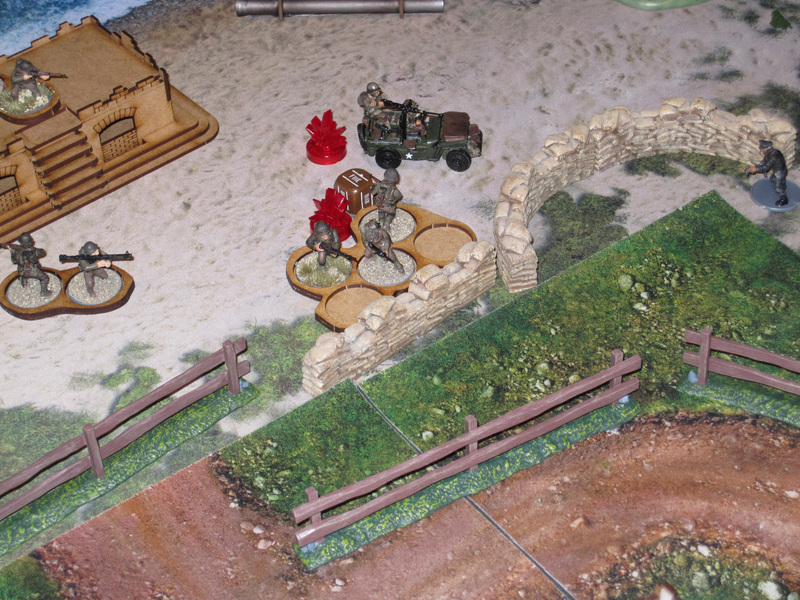 The game ended on the 7th turn with his LT on the objective and my mortar team having run up to great cover that was half an inch away from the objective. 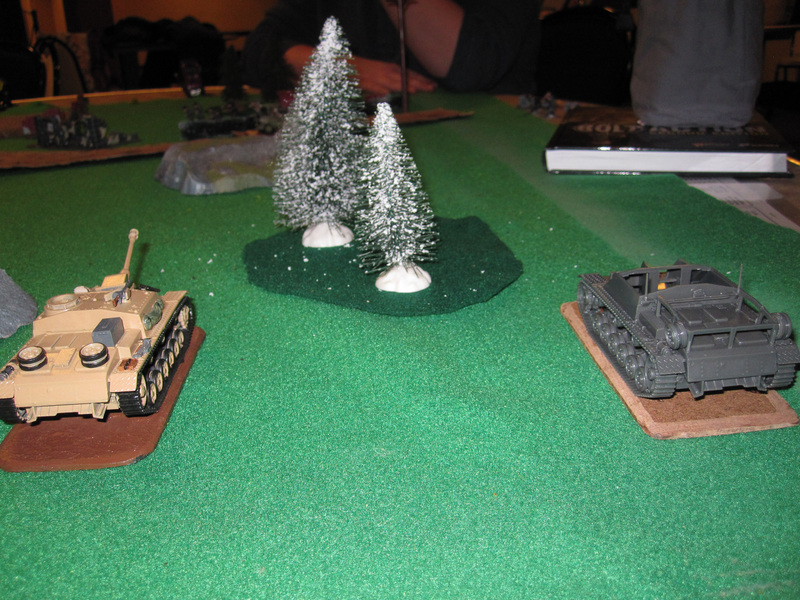 I was taking pictures of the other games when I could, but didn’t pay too much attention to them. 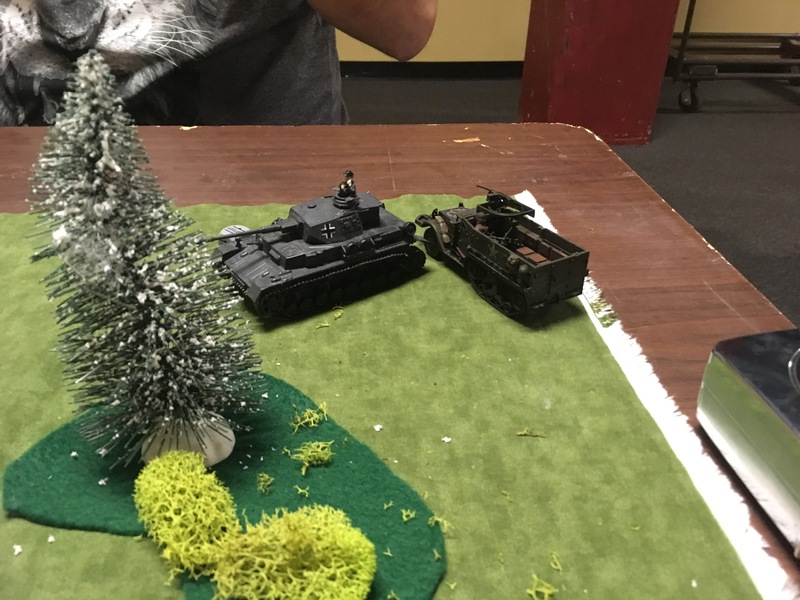 The highlight of my friend Murphs game I did catch was his opponent sneaking a Puma to point blank range behind his Stuh and missing, only to have a squad with a panzerfaust take a long range shot and blow it up! 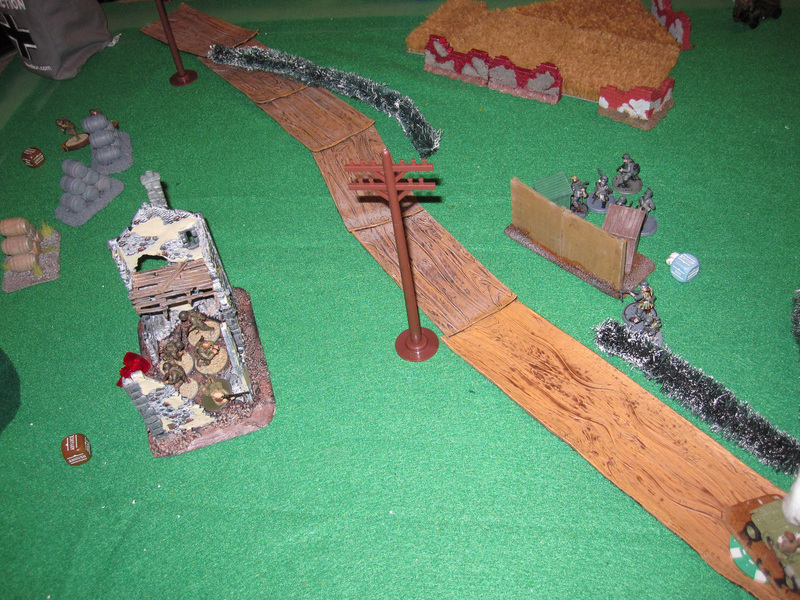 The Stuh got to live and rain HE death down upon some Waffen SS dogs! 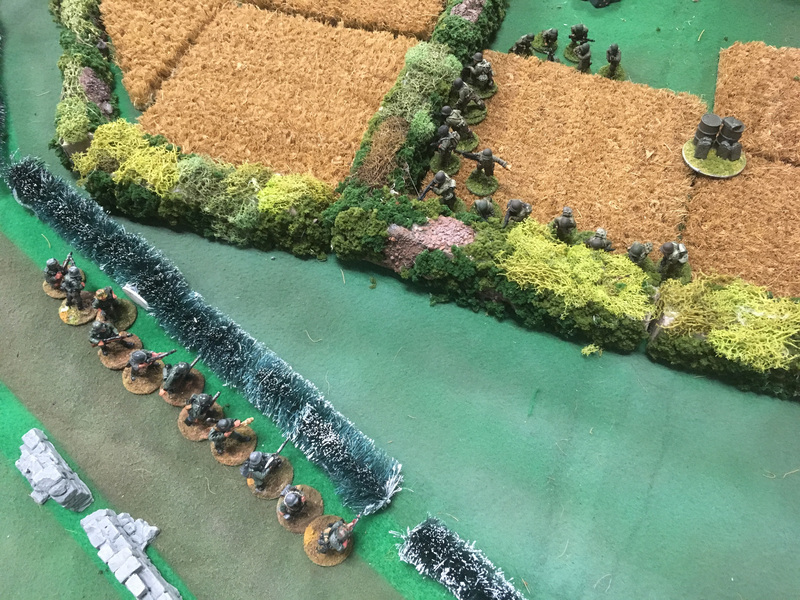 Airborne: The Battle of Carentan review. 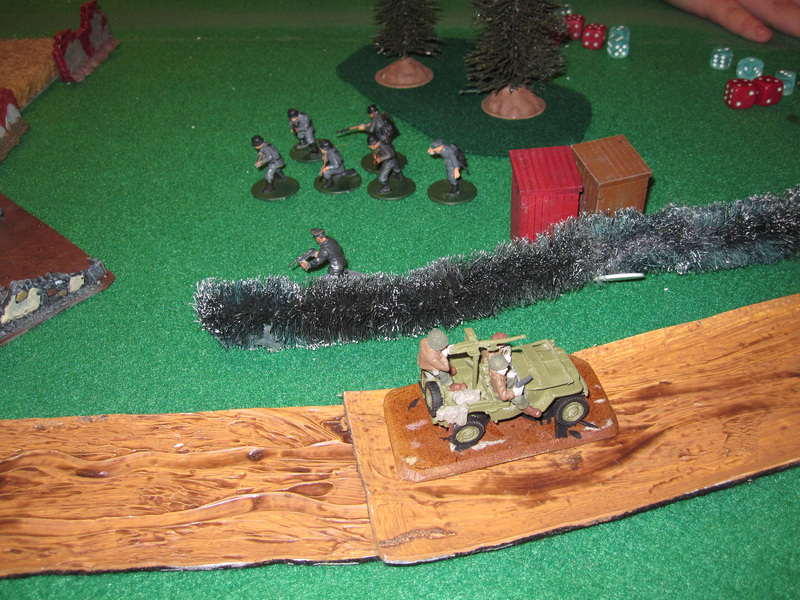 I’ve only been wargaming seriously for about six years now, and have only been playing 28mm WWII for three years. Compared to a lot of people I’m like a babe lost in the woods. 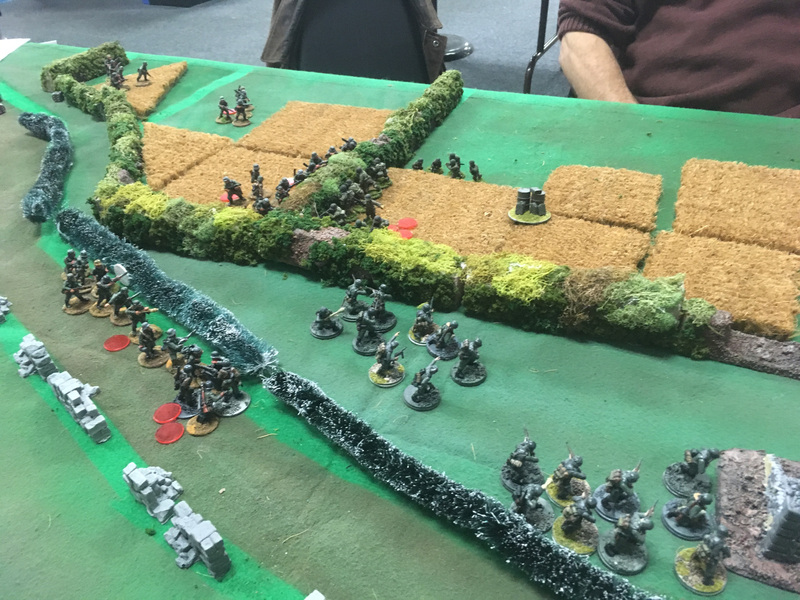 After a year of playing Bolt Action my desire for something more historical lead me to Chain of Command and growing interest in the battle for Carentan shortly after D-Day. 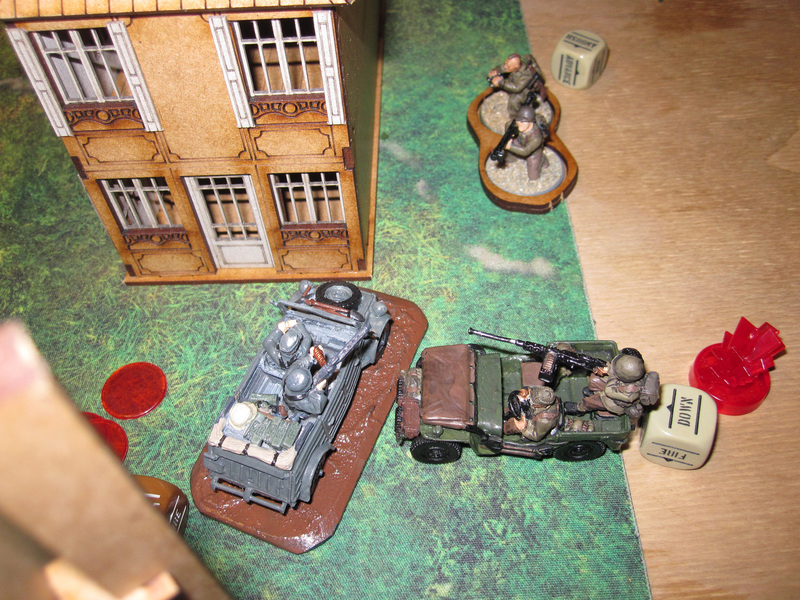 The problem with Carentan seems to be that it was a relatively short battle and, although pivotal in securing Normandy and linking several forces together, it went fairly quickly and without too many problems. It seems to get glossed over and aside from some chapters in what amount to biographies of men or units there doesn’t seem to be a whole lot of academic style writing on it with maps and non-anecdotal reports. 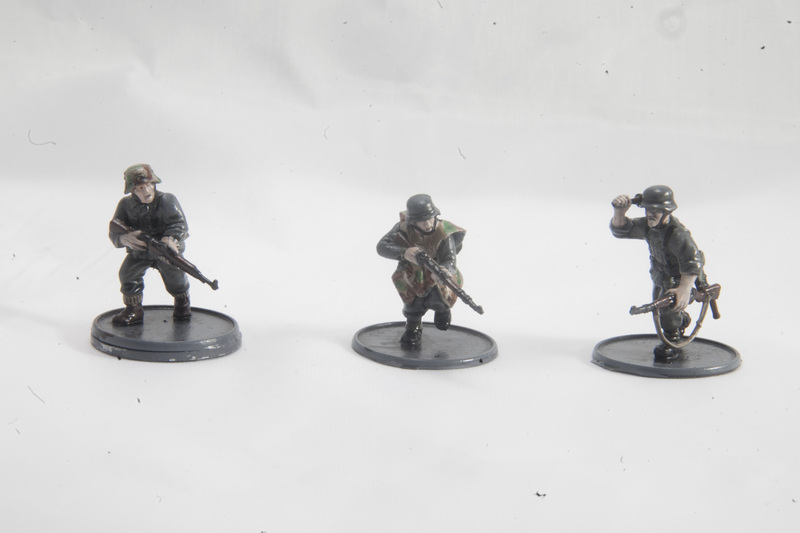 This past year was rough and I was planning on picking up a couple of books I had found out about and doing some more research to make a series of linked scenarios around Carentan for Chain of Command and Bolt Action. 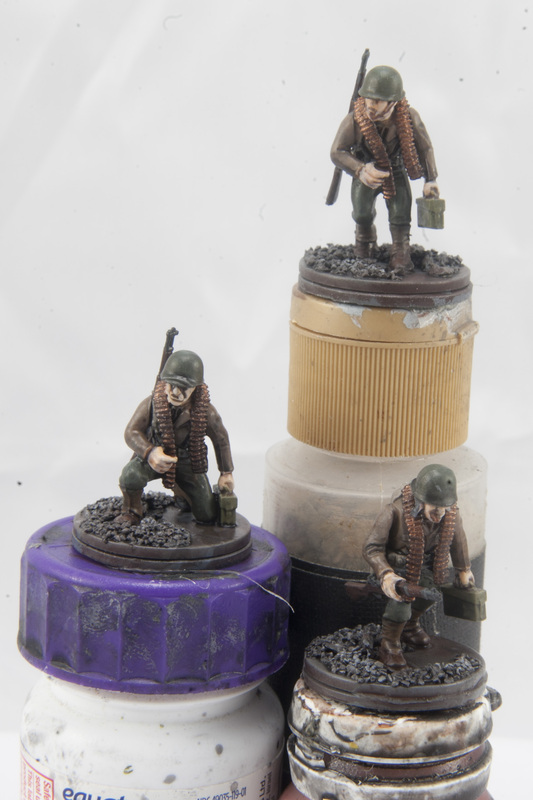 I was just starting to think about it again and trying to figure out when to start to get ready for an October convention when I see an ad on The Miniatures Page for Britton Publisher’s Airborne: The Battle of Carentan, procrastination won out once again! After a little searching and an unkind utterance in regard to the website I plunked down my $11 and bought the PDF. 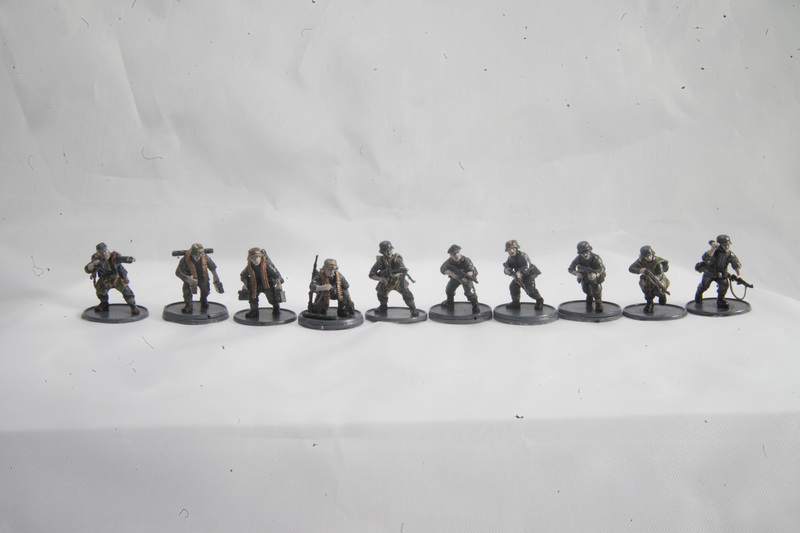 The book has 12 scenarios ranging in size from a single squad to company level engagements. 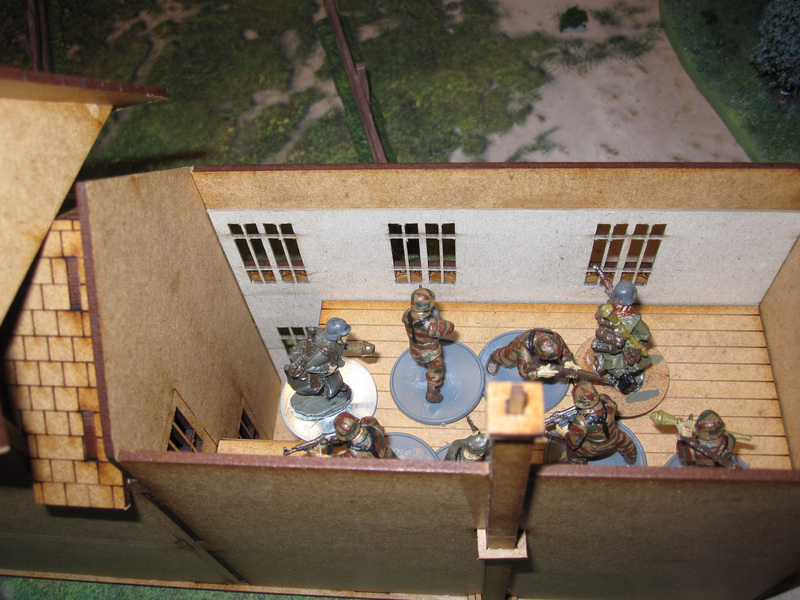 A quick count shows 1 squad level scenarios, 4 platoon level scenarios, 3 company level scenarios and two scenarios each that are either platoon vs company or squad vs platoon engagements. It starts off with several pages describing the background to the battle, the German forces involved, how they rate the troop qualities, and describes a number of important considerations such as the hedgerows, marshes, bridges and the Belgian Gates that held off and funneled the American troops as they approached Carentan. 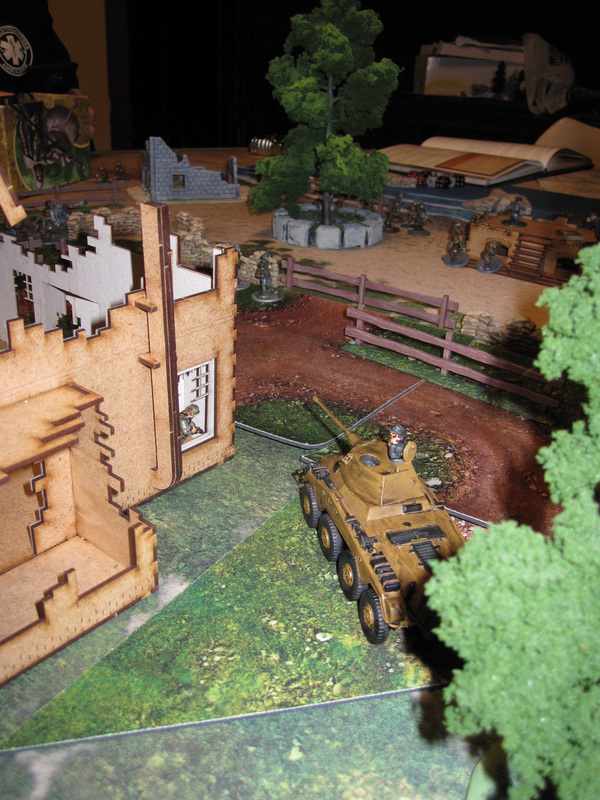 Throughout the book there are some very good contemporary military maps, aerial reconnaissance photos and modern satellite images and in a couple of places some photos of gaming table setups. 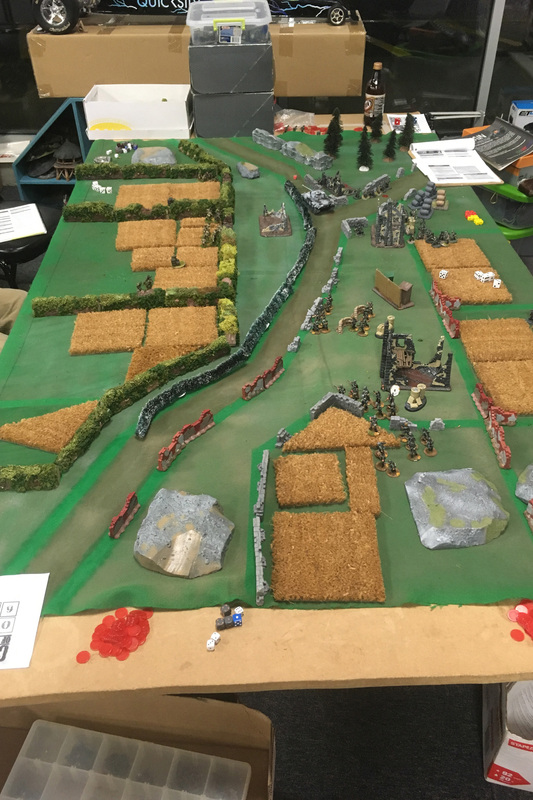 Every scenario has a paragraph or two of the setting and lead up to the scenario, a solid breakdown of the forces involved, the victory conditions and the historical outcome and aftermath. It also has GM’s notes and deployment rules where needed, and also has footnotes and citations to the books referenced in the sources section. This book is well researched and a treasure trove of information for the battle of Carentan. This is the fourth book in their Airborne series chronicling the battles from D-Day though Carentan. They’re $11 for the PDFs or $17 for the printed versions. With 12 scenarios in each book you could spend years fighting these battles out! 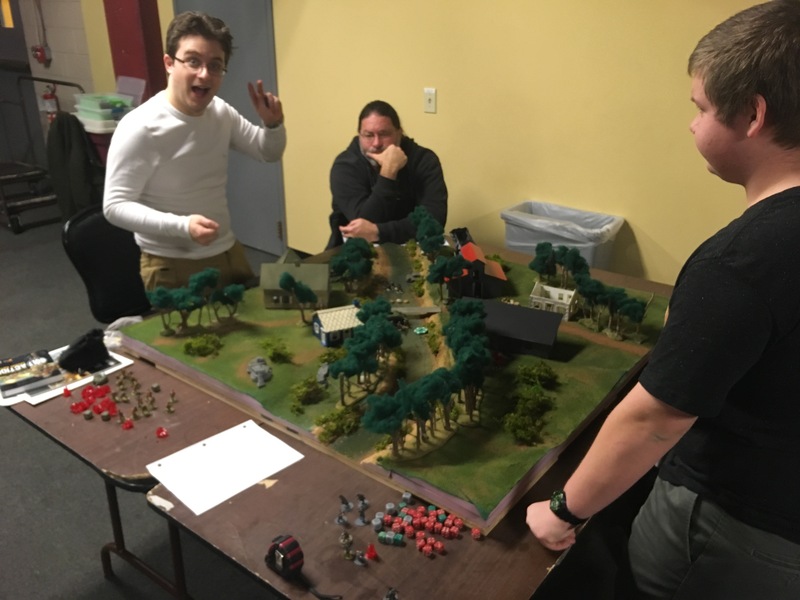 This is the first scenario book I’ve read that wasn’t from a games manufacturer and I’m very pleased and the variety of scale included in these scenarios, a friend of mine wants to try out Nuts! and I think the smaller scenarios would be perfect for it. I’m very happy with this book and will almost certainly pick up the rest in the series. Forgot to add links to the books the first time around! 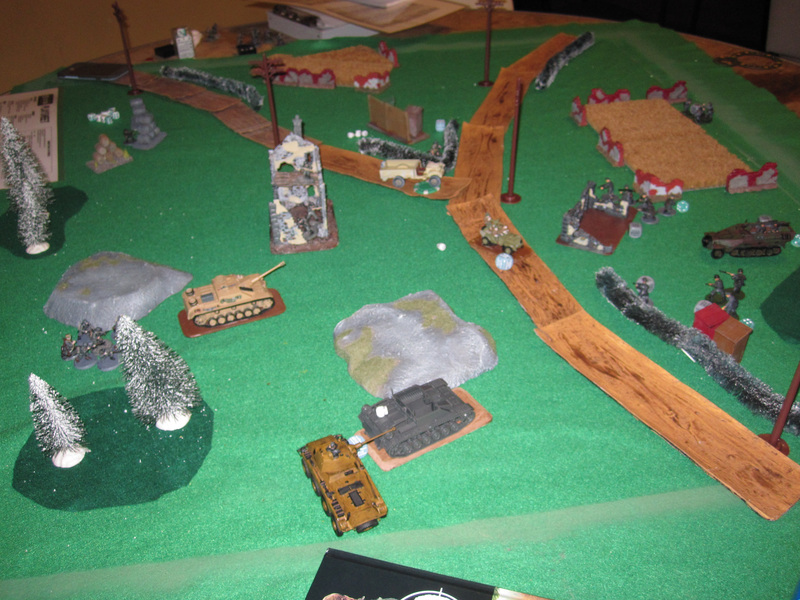 Author addictedtolead_0nuevlPosted on February 10, 2017 February 10, 2017 Categories 28mm WWII, Bolt Action, Chain of Command, WWIILeave a comment on Airborne: The Battle of Carentan review. 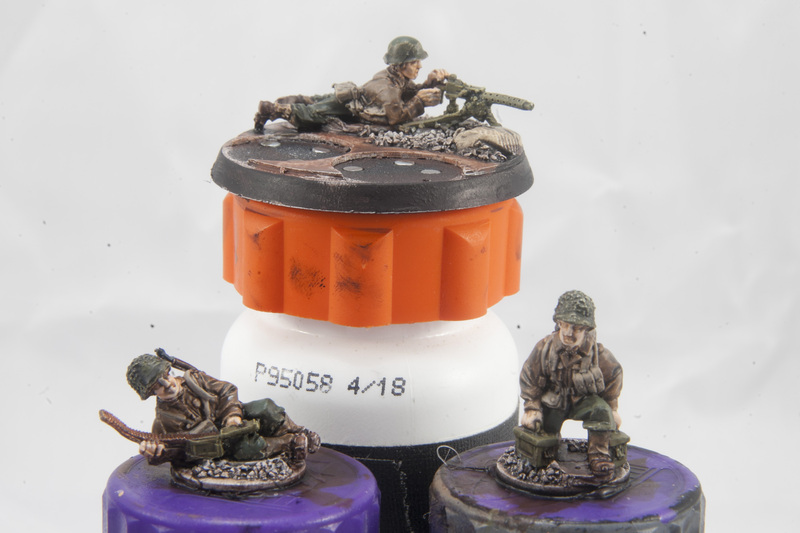 Author addictedtolead_0nuevlPosted on January 23, 2017 Categories 28mm, 28mm WWII, Bolt Action1 Comment on (still) cleaning off the painting desk! 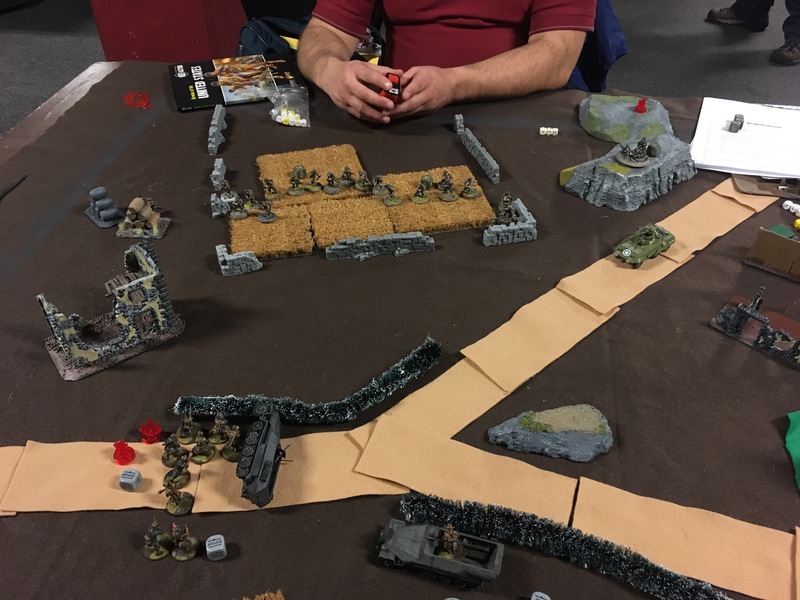 Last week before the big Bolt Action event I played a game of Chain of Command with a couple guys that I meet up with occasionally. 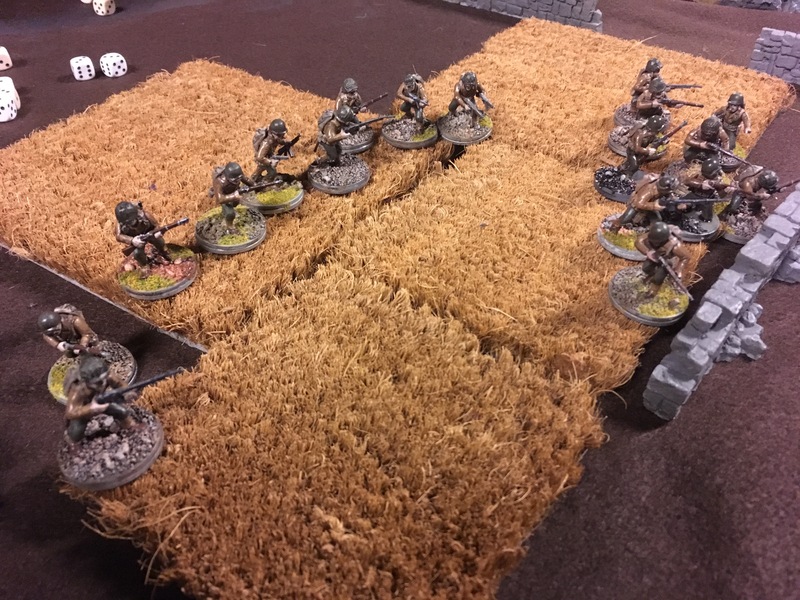 The last half of 2016 was a little rough and I hadn’t played anything for awhile so I was eager to get in a game when Dan suggested Chain of Command. 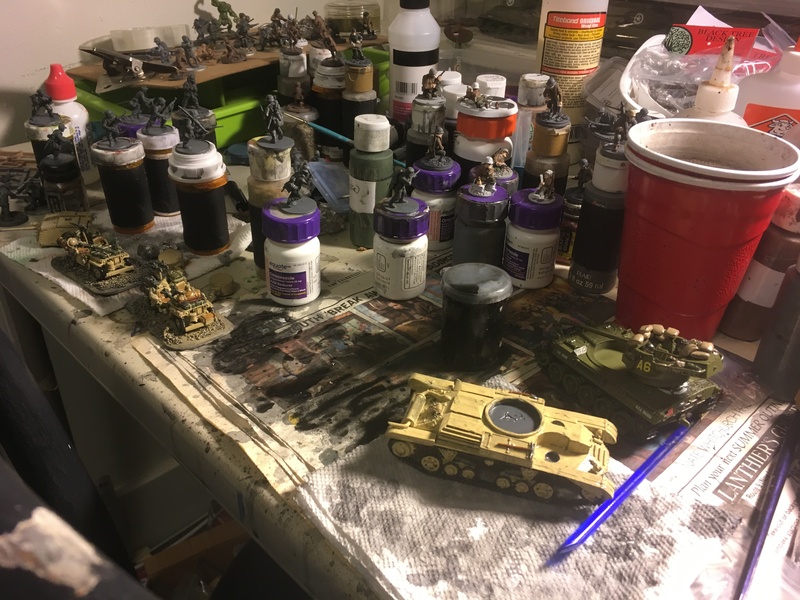 I already had to pack up the car for the weekend so I just brought everything along and threw the table together while waiting. 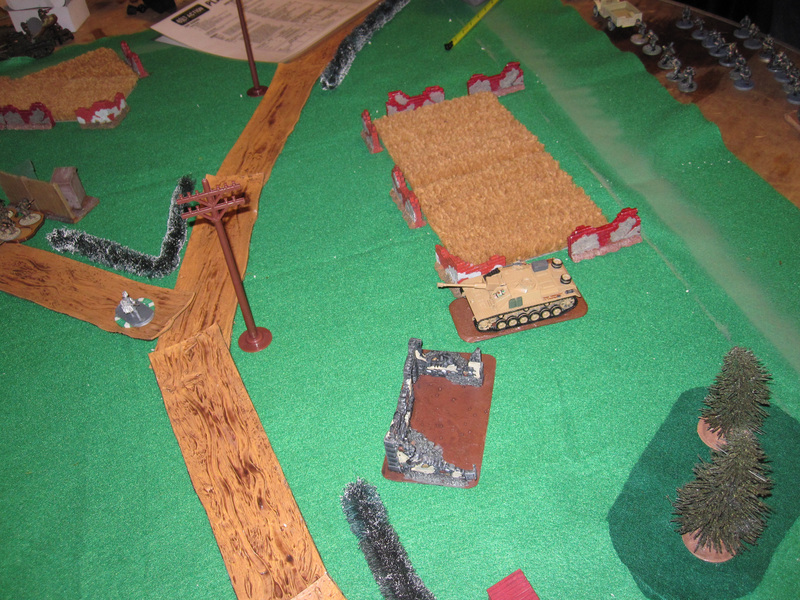 We did a simple attack/defend scenario with two regular German platoons defending against one American attacker. 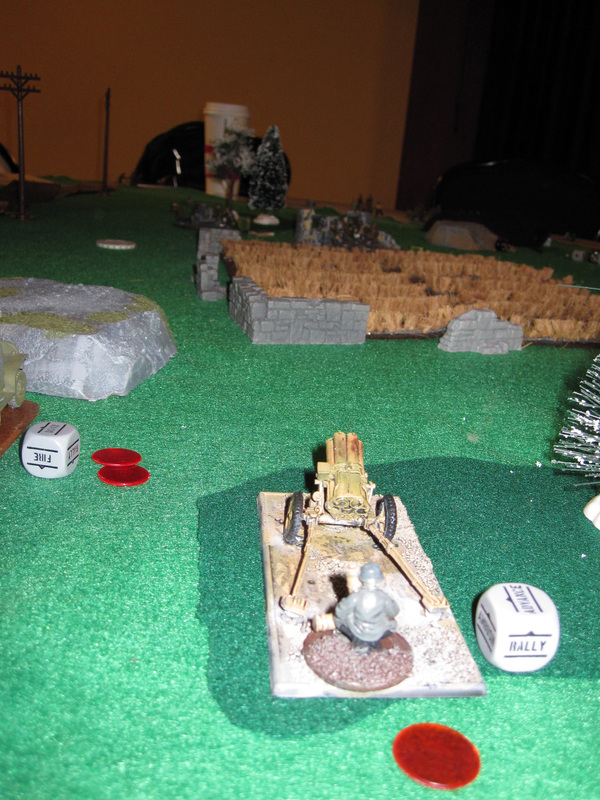 Dan used his Americans, with a .30 cal and a mortar for support, plus an extra squad if I remember correctly. 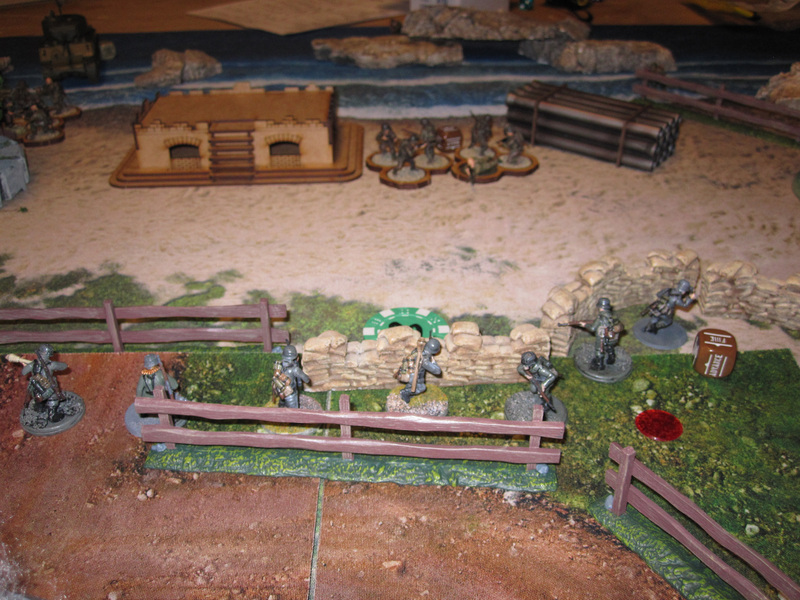 Howard and I had only a tripod mounted MG42 to back us up. 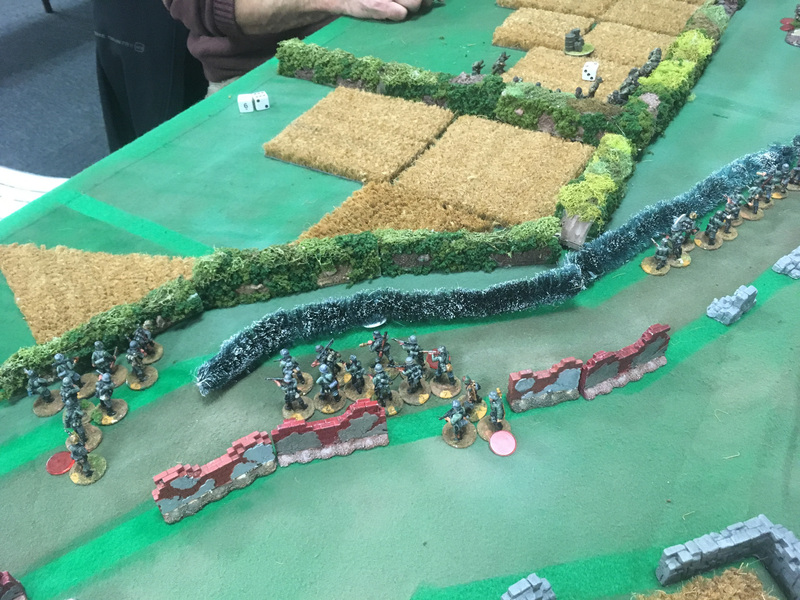 The German counter attack came quick as I had a couple of good rolls and took three activation’s, locking down a side of the board with one squad and started throwing some pins around and kept the Americans behind a hedgerow with two squads taking cover behind a stone wall. 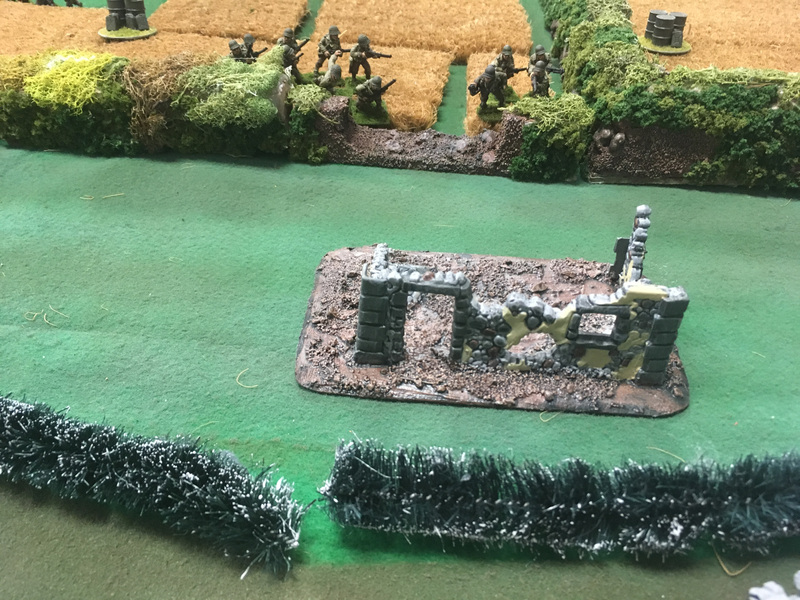 Howard’s platoon took the long way around the board and eventually did some real damage to the American platoon by rushing a hedgerow and creating a crossfire, decimating a squad with a hail of grenades. 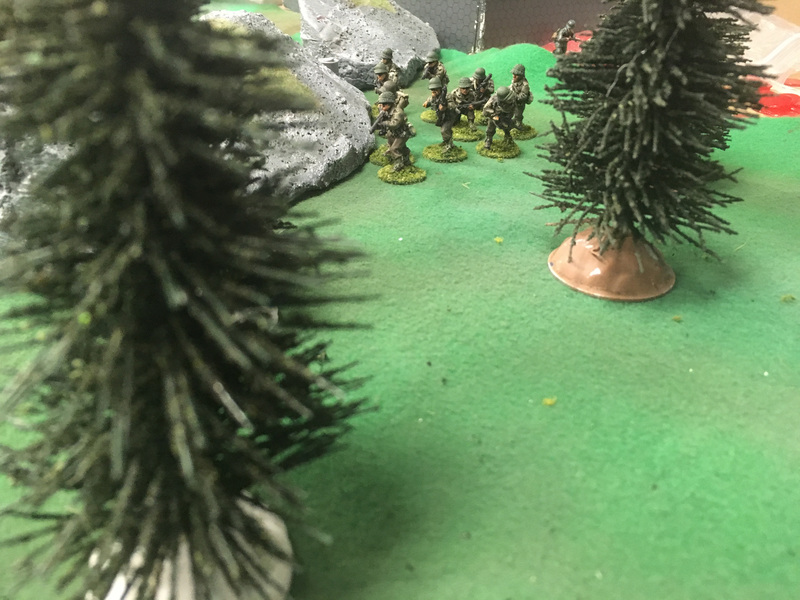 The Americans eventually took the flank that I was holding down with a lone squad and threatened a jump off point, but had suffered some morale loss during the turn. 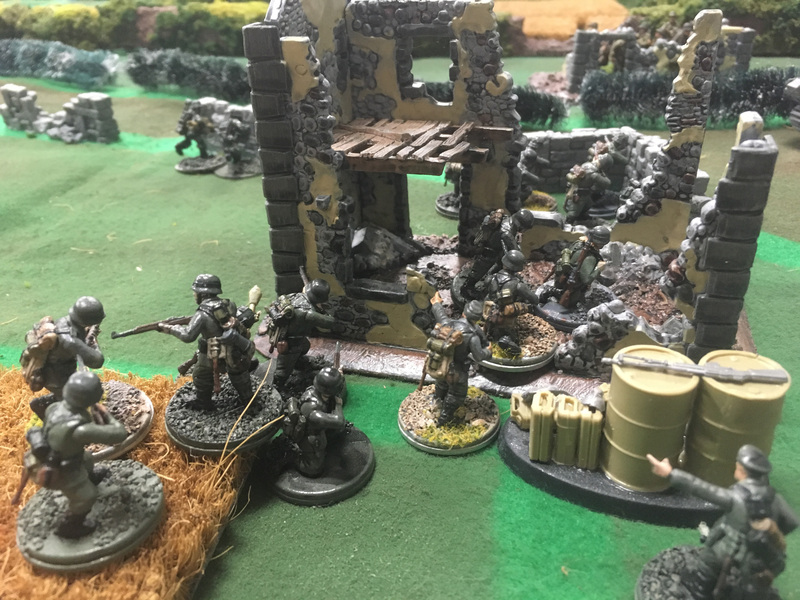 We had to call the game due to time, but the outcome was clear: The Germans were threatening two jump off points and the Americans had two broken squads (or what was left of them). 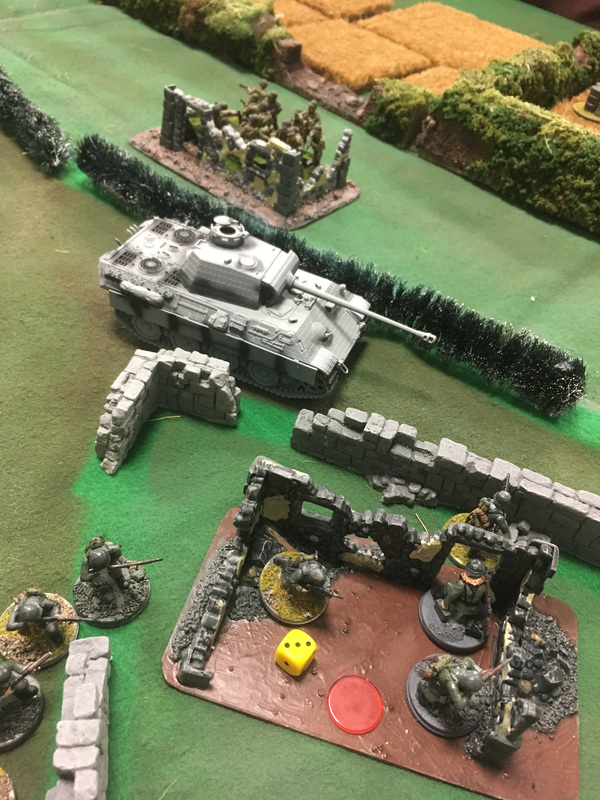 I had a full Chain of Command die and could almost certainly end the game with a good round of fire and then use the die to end the turn, routing the broken units and cause a complete loss of morale. 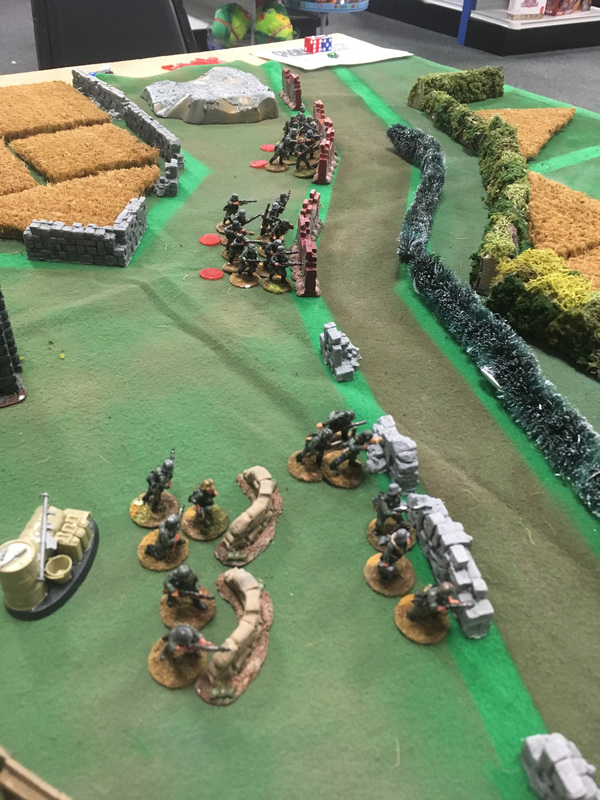 The Americans were at 5 morale and even good rolling on their part would have brought them to 1 or 2 morale, severely limiting their activation dice and just prolonging the end. I’ve played several 3v2 games and the suggested balancing of adding a full CoC die to the side with fewer players worked well enough. 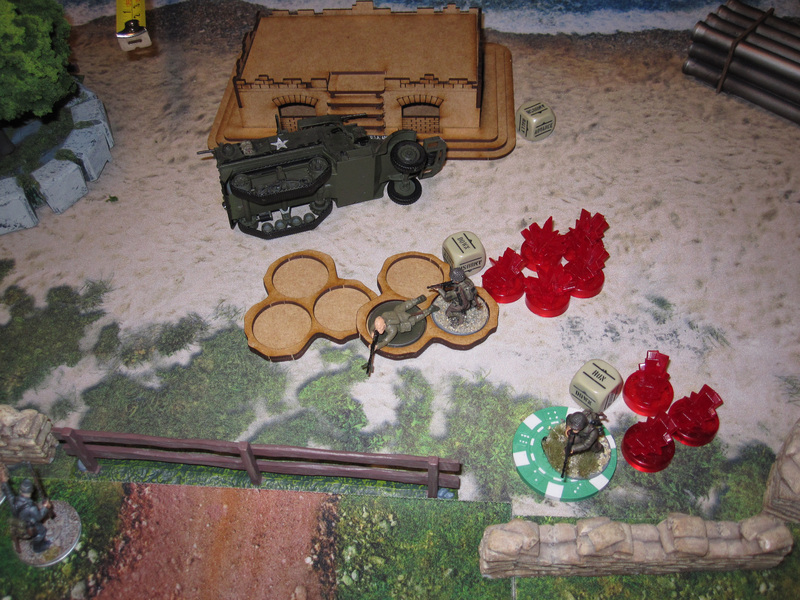 I think Dan was simply out activated, an extra chain of command die wasn’t nearly useful enough to balance the game. 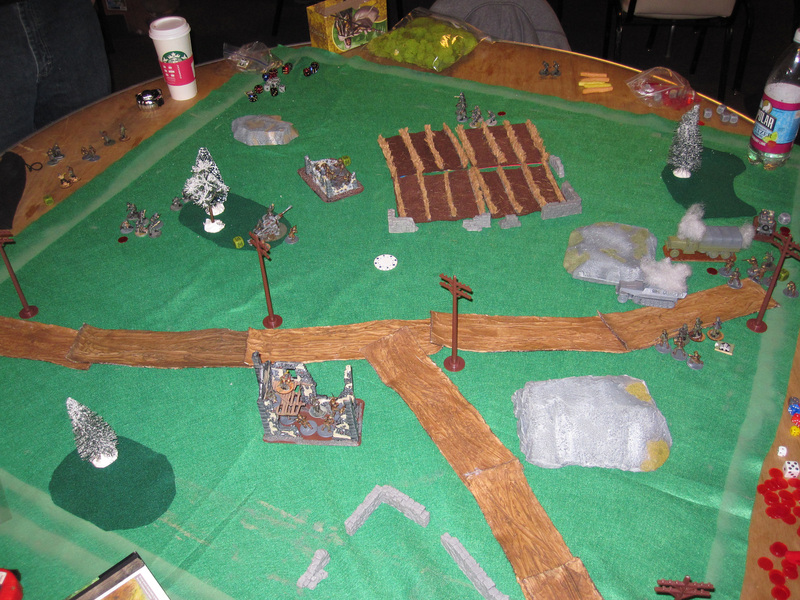 I think next time we do a 2v1 game we will make the lone player elite, with six activation dice. 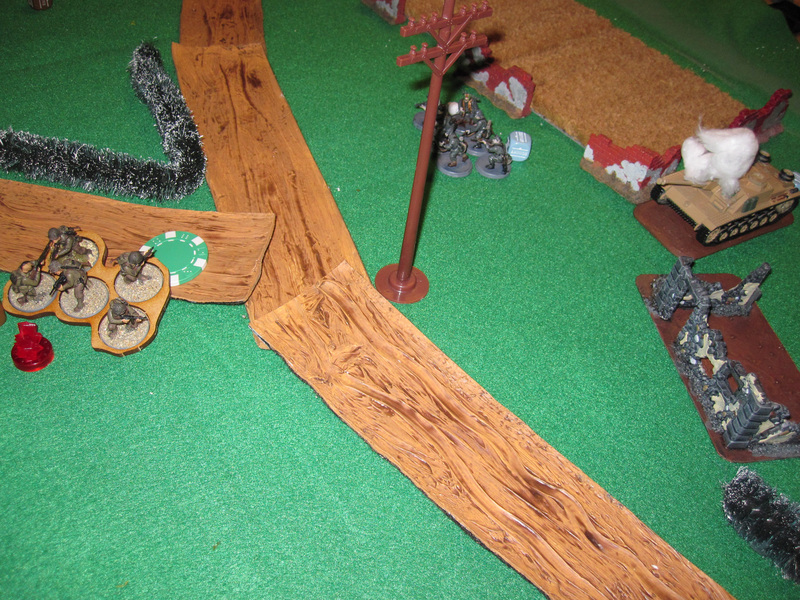 I originally thought that an extra die of support would do, but without the dice to activate that’s not much of a help. 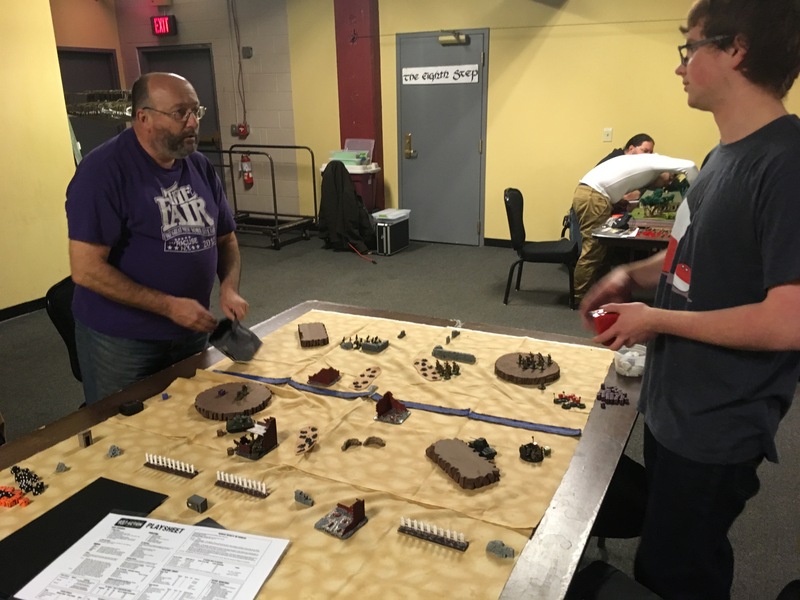 I’m participating in a large escalation league that includes groups in New Jersey and several locations in New York including my hometown club the Schenectady Wargamers Association. 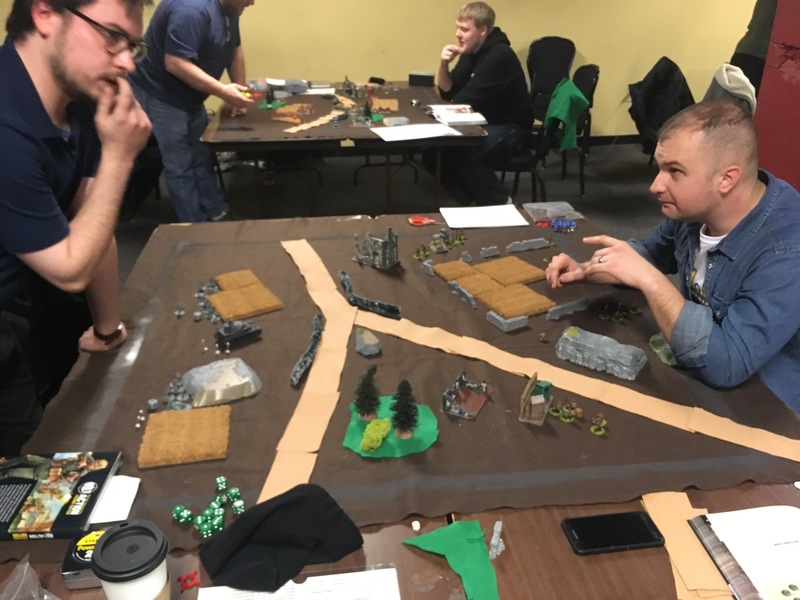 We had a large event at their monthly gameathon this past Saturday and it was a a huge success. 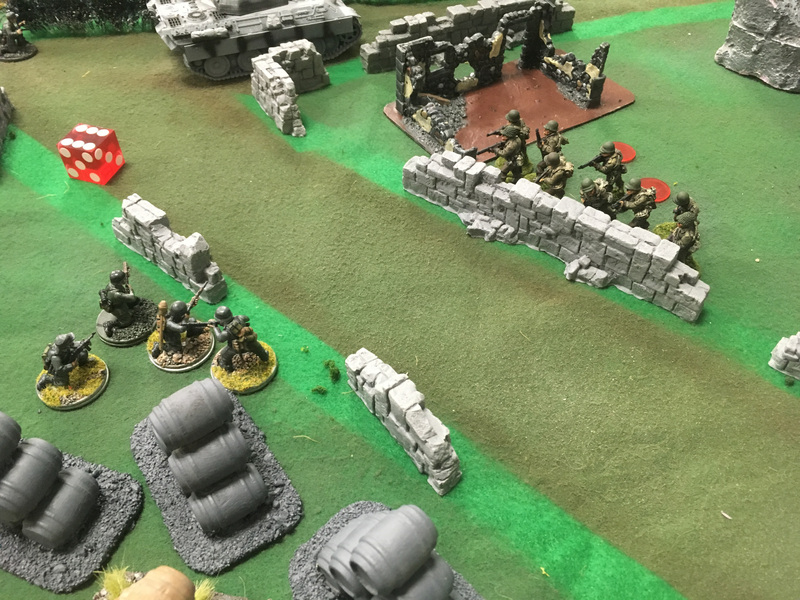 We’ve tried getting the local Bolt Action community up and running and it’s been hard with mixed support from game stores and Bolt Action themselves. I got a buddy into the game a year ago and he finally got fed up with the lack of success and we teamed up to get something going. 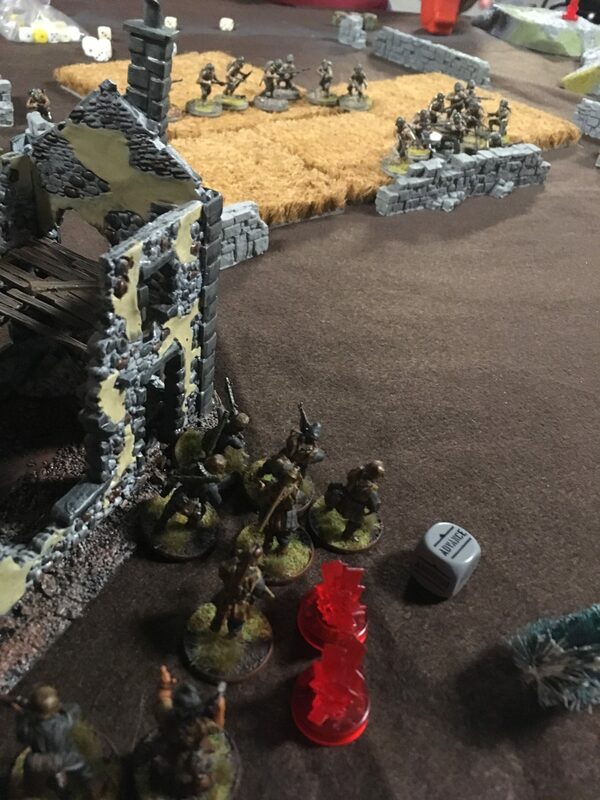 A new game store opened in the area with a group that was already trying the game out and we had a van full of people from 3 hours away come also! 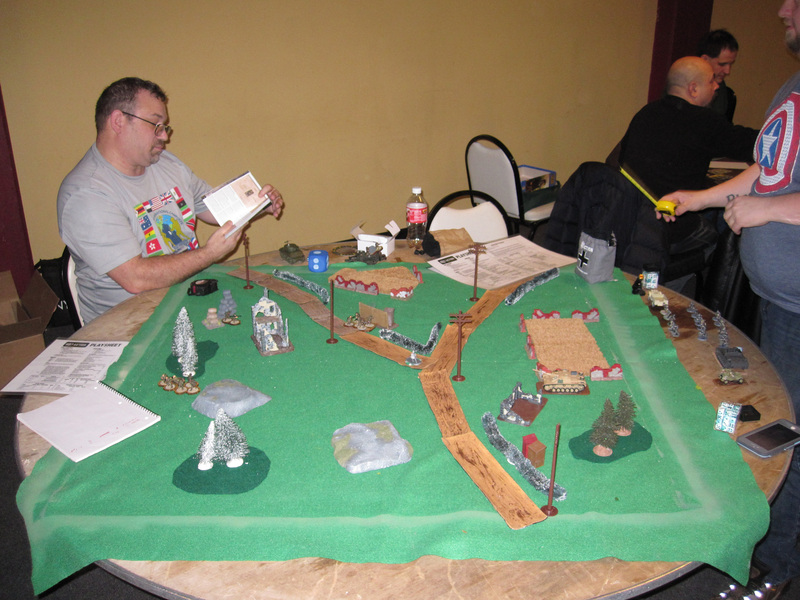 The tally was 6 tables with about 15 people playing at least one game each! 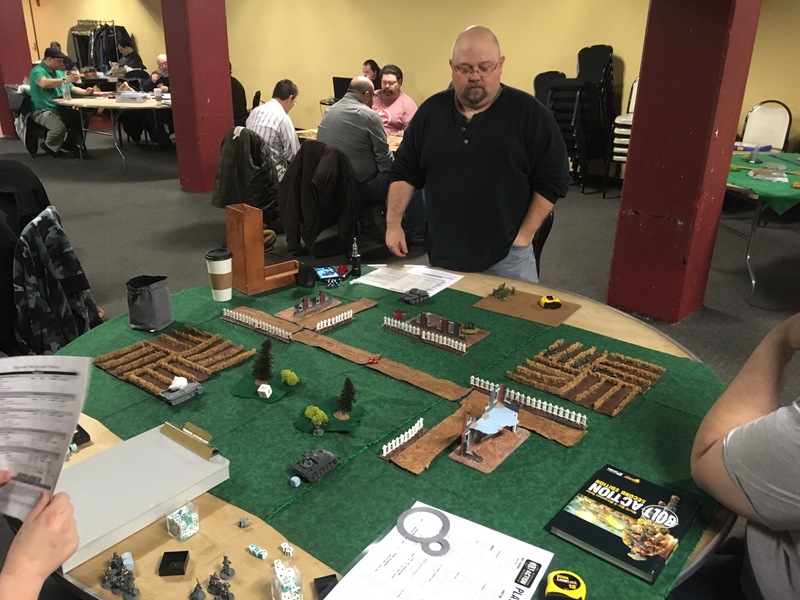 It was a huge success and we’re looking forward to our next full day event in June, along with the escalation league days leading up to that. 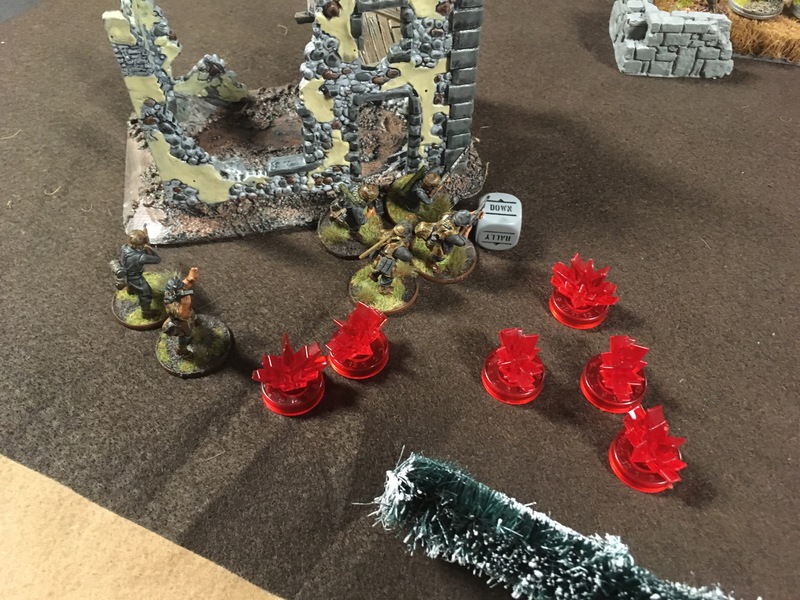 We started the league off at 500 points, to get players used to the new version of the rules and changes to the missions. 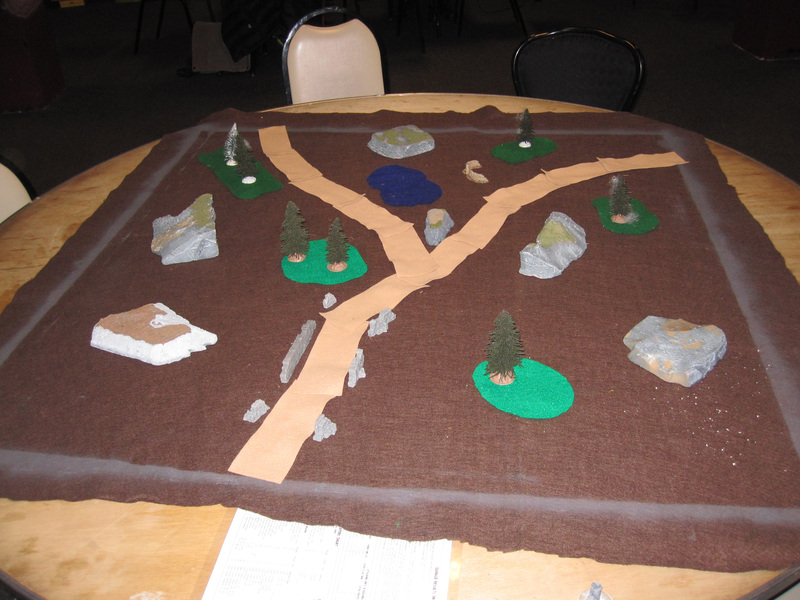 This gave us the added bonus of not having to fill 6 6×4 tables with terrain. 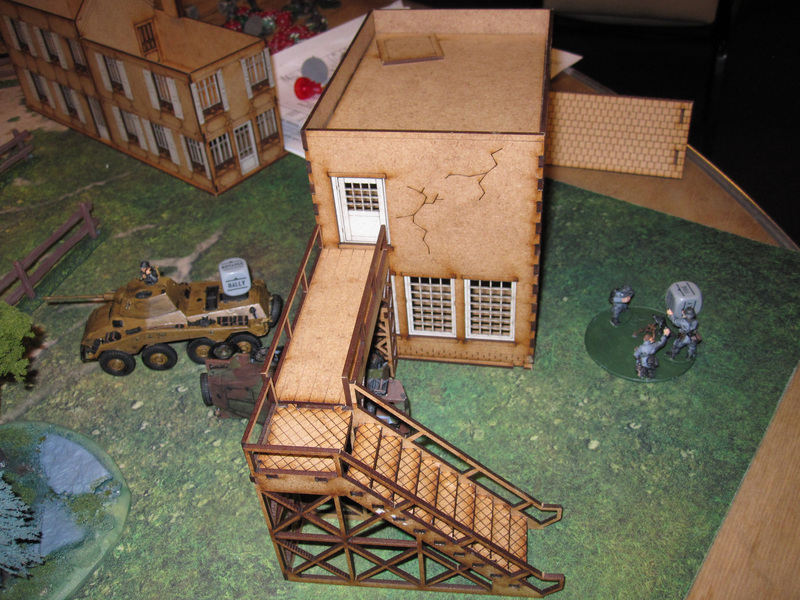 I have a bunch of terrain that I use to fill out 6×4 tables for Chain of Command and Bolt Action and can put together a good looking table. 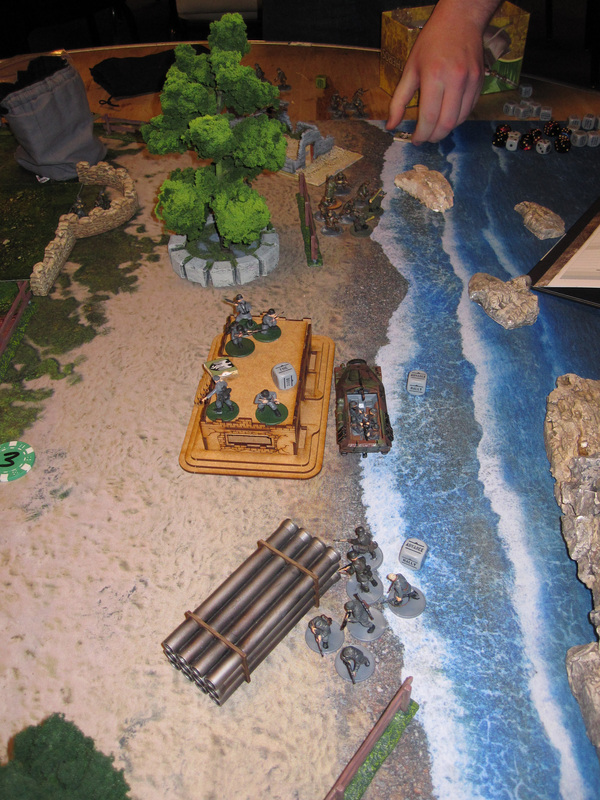 But filling 6 tables up takes a trunk full of scenery! 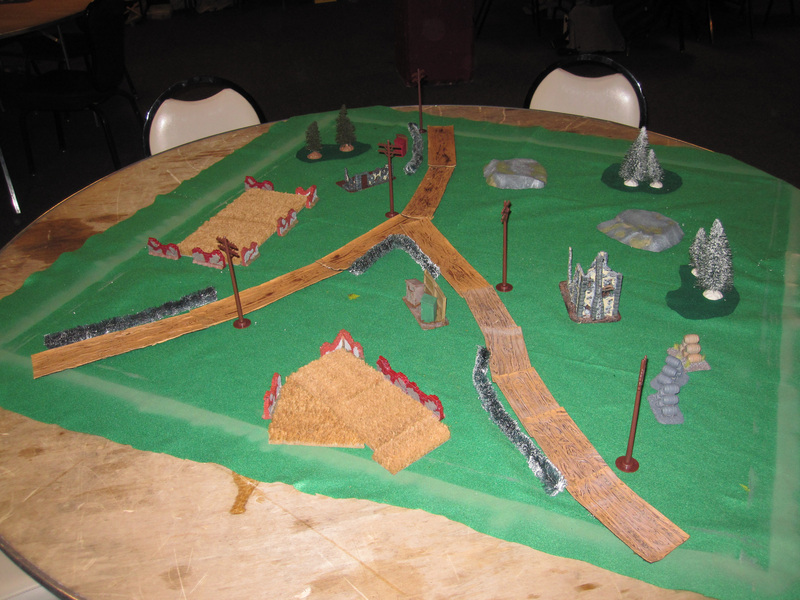 We were able to get the tables looking OK, although the felt clothes haven’t been painted yet and are bare. 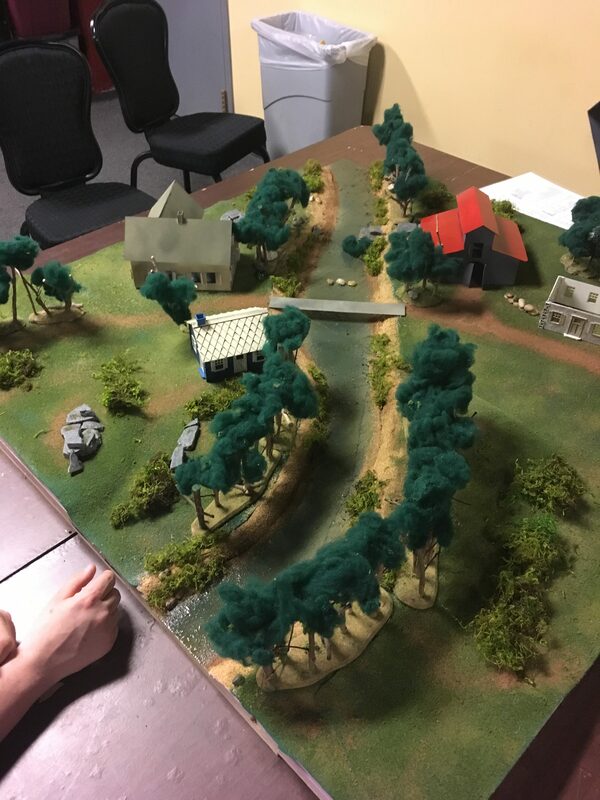 Next month at 750 we’re planning on using the same setup so I’m hoping that they’ll be spray painted and more of the bare terrain is painted! 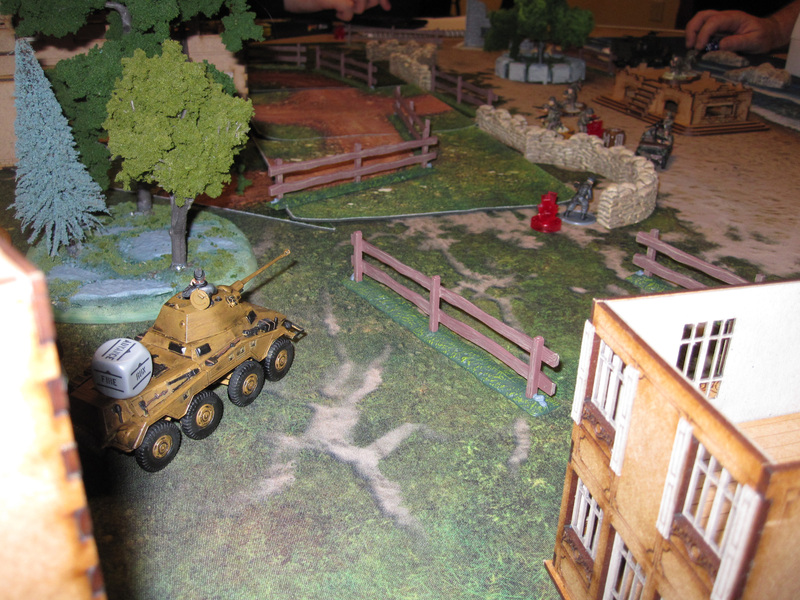 Unfortunately the fantastic table my friend Ron set up, with 3d hills and streams and all scratch built buildings won’t upload for some reason. By far the best table we had. 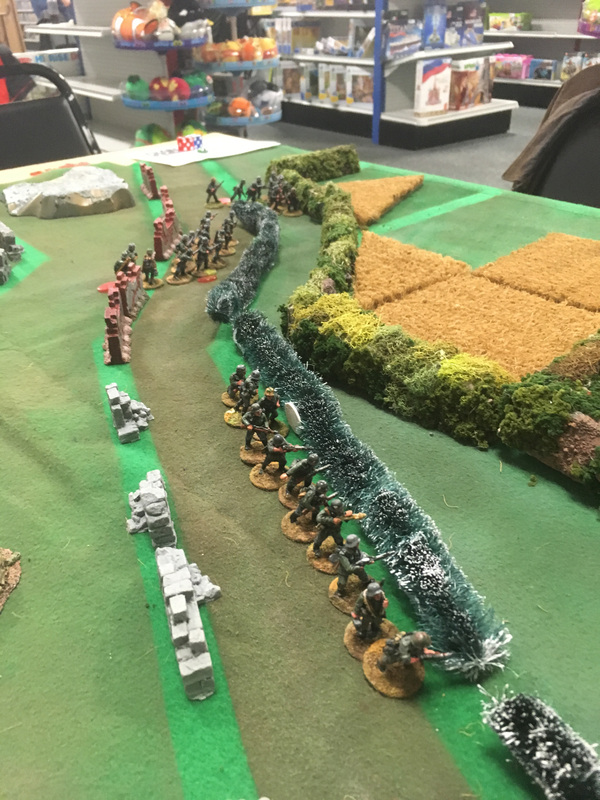 The games went well, several players were experienced Bolt Action version 1 players and some had a couple of version 2 games under their belts. There was a lot of rules reading and lesson learning going on! 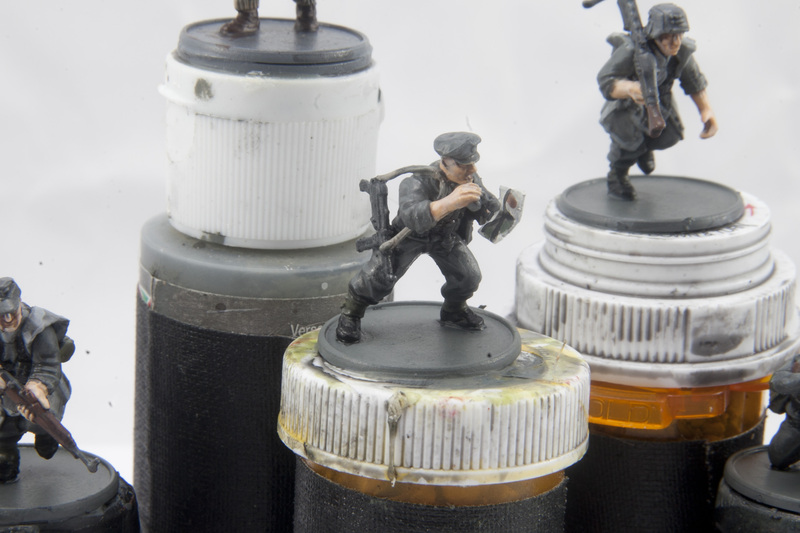 Cleaning off the painting desk. It’s a modest 2 foot by 4 foot desk by a window that gets a good amount of light when it’s not sealed up for the winter. I had a day off so I decided to finish a couple of things off. 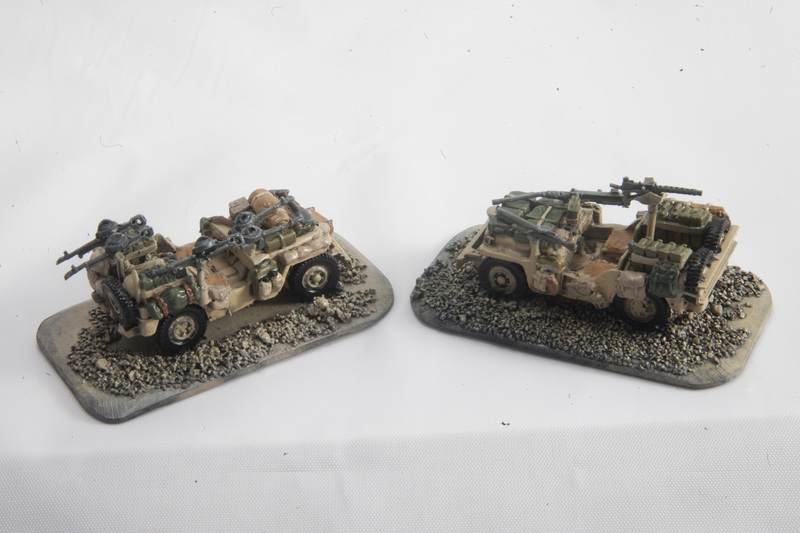 First up was a couple of SAS jeeps for my buddy. 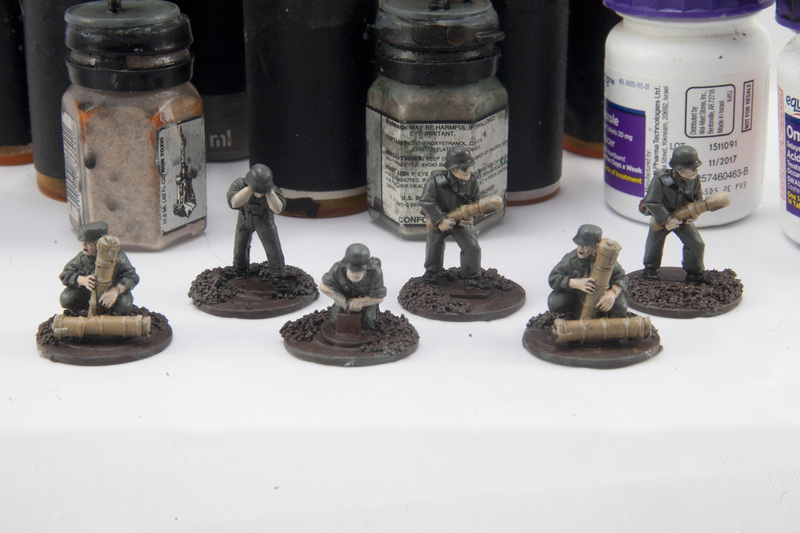 They just need some quick dry brushing and a coat of matte sealer, I had applied a wash to them yesterday and it was dry. 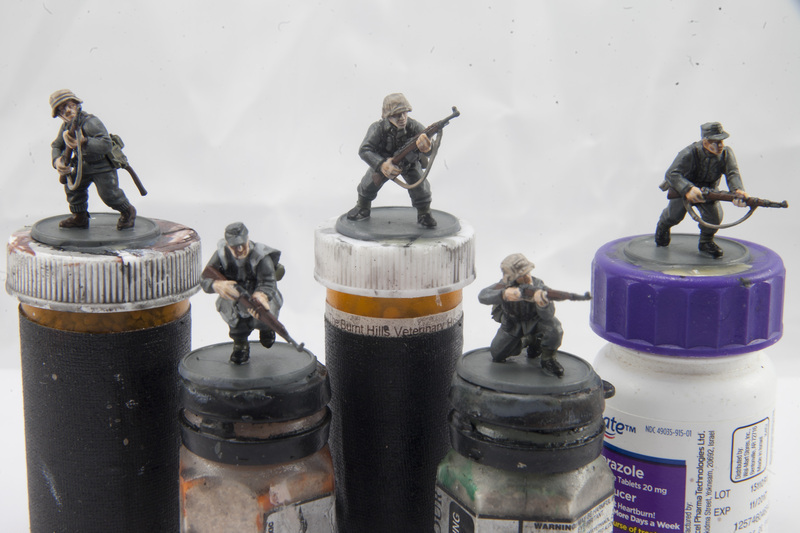 The bases aren’t done but none of the bases on the mini’s are flocked either so they’ll wait to be all done at once. 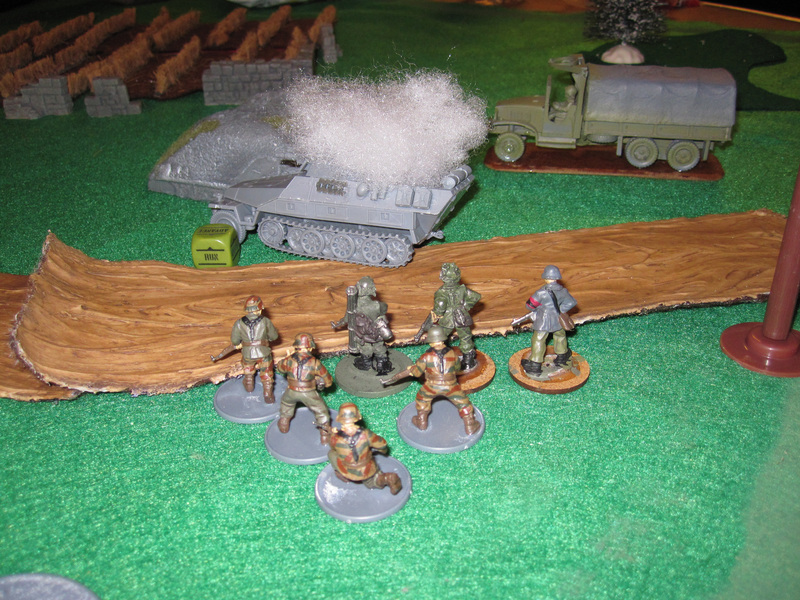 Next up was some German infantry for the same buddy. 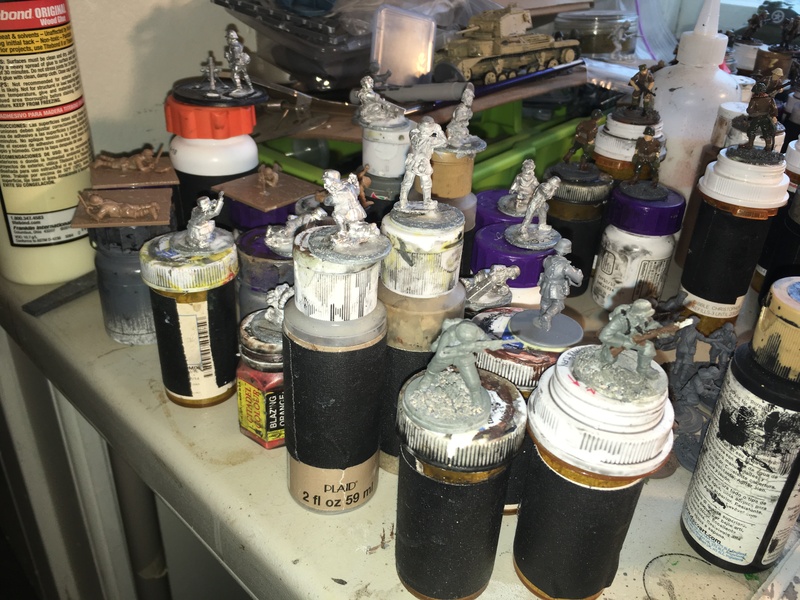 He’s doing a late war Panzer Grenadier army for the Bolt Action escalation league that just started so I made up about 30 guys to fill his projected list for 750 points and started painting them randomly. 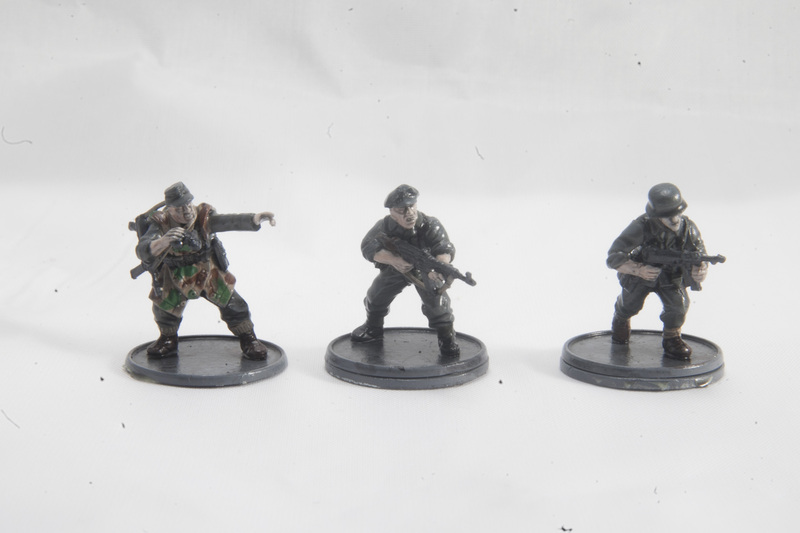 I want to emphasize the late war aspect of the army by changing up the uniform and equipment colors and I’m using ‘scavanged’ equipment in the form of spare gear from different sets. 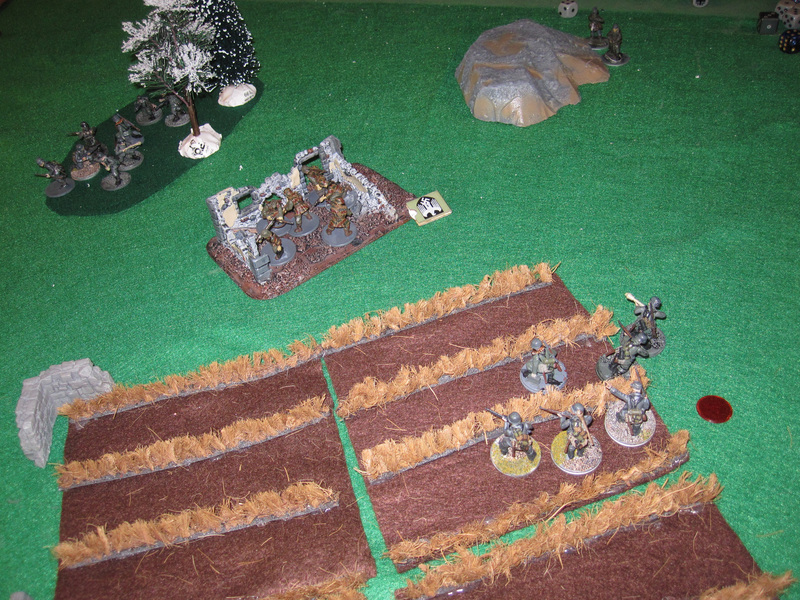 I ran out of the washers we use to add weight to the bases. 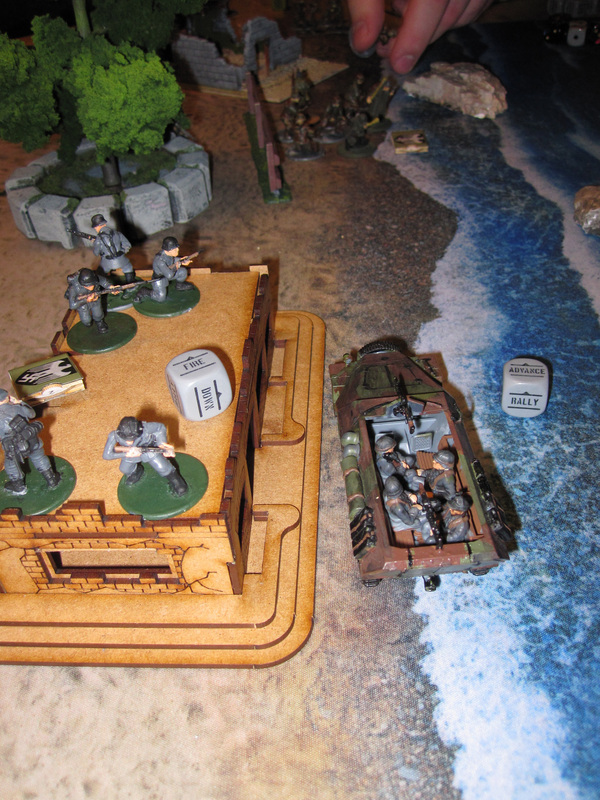 We’ve found that the plastic minis are so light that they simply fall off of hills. With the washers they have some more substance and stay where they’re supposed to. 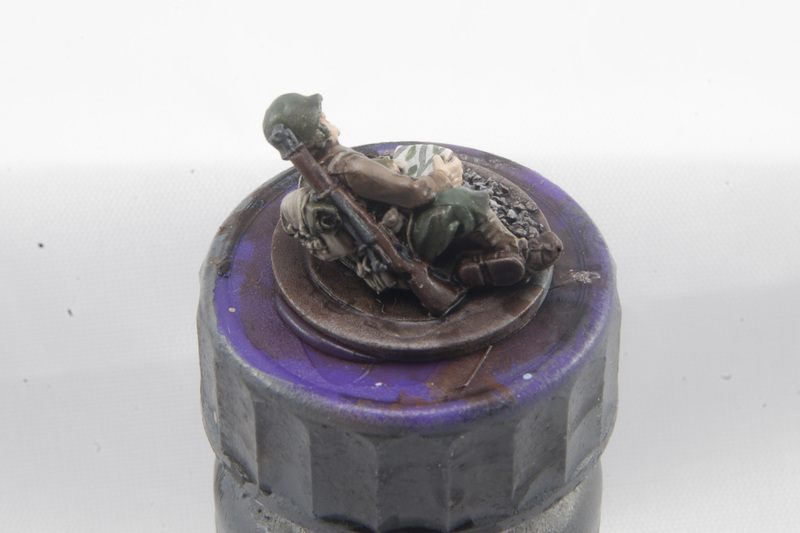 They also have the added benefit of usually;y falling with the base down, minimizing damage to the figure itself if dropped. 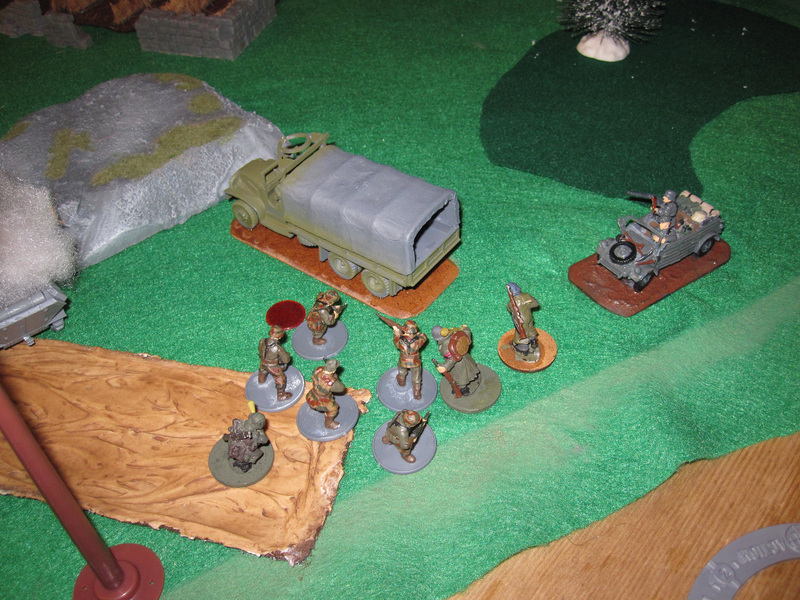 I also mostly use galvanized washers which makes magnetic carrying cases usefully. 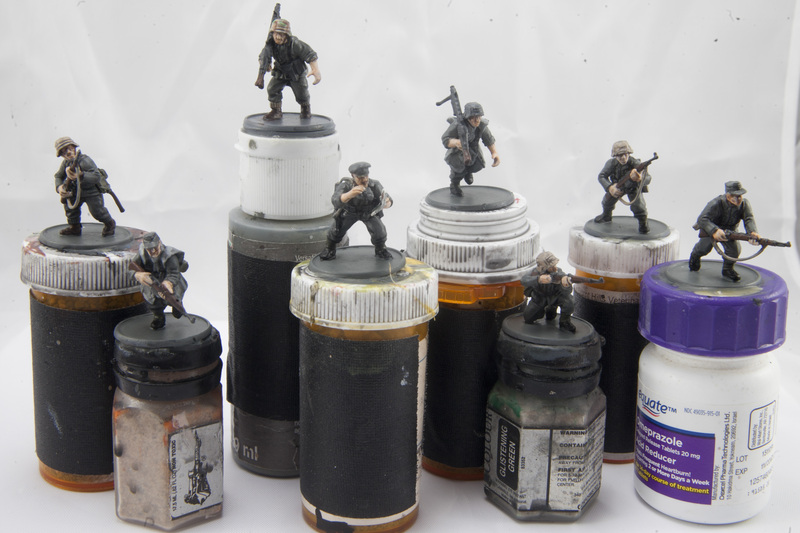 I’m waiting to get a critical mass of figures done to flock the bases. Lastly is a flesh golem for our weekly D&D campaign that I run for my boys and my girlfriend. 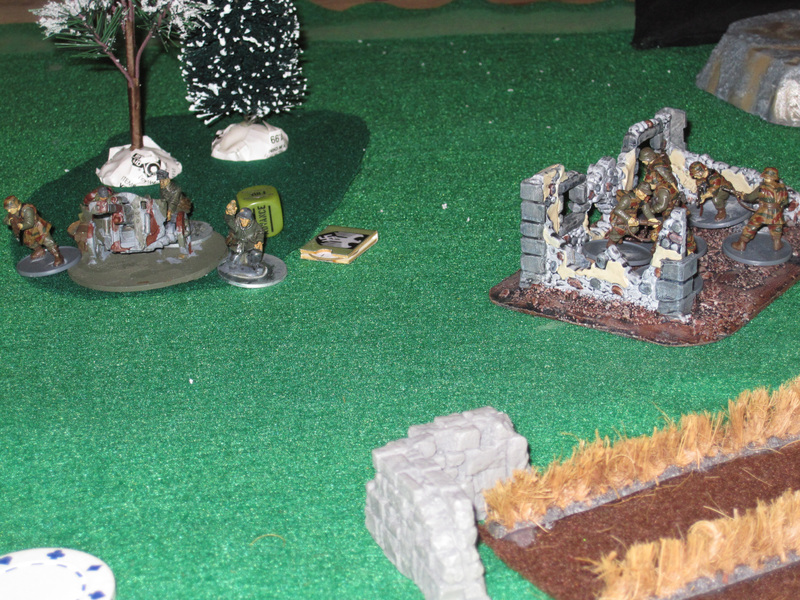 I got this Reaper flesh golem once they found the magical manual to create it. I think they’ve forgotten about the manual but I needed to get this finished up and off of the desk anyways! 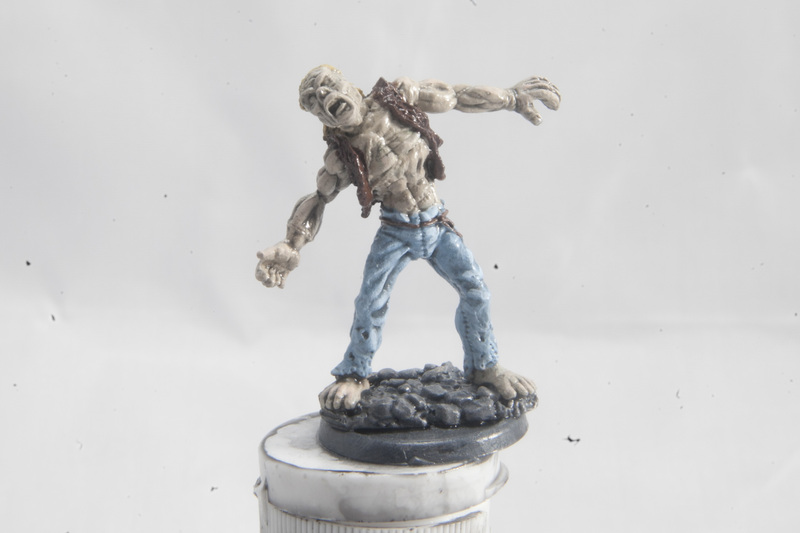 I generally put a little less effort into the monsters and sidekicks for the D&D game then I do, usually just a base coat and a wash and that’s it. 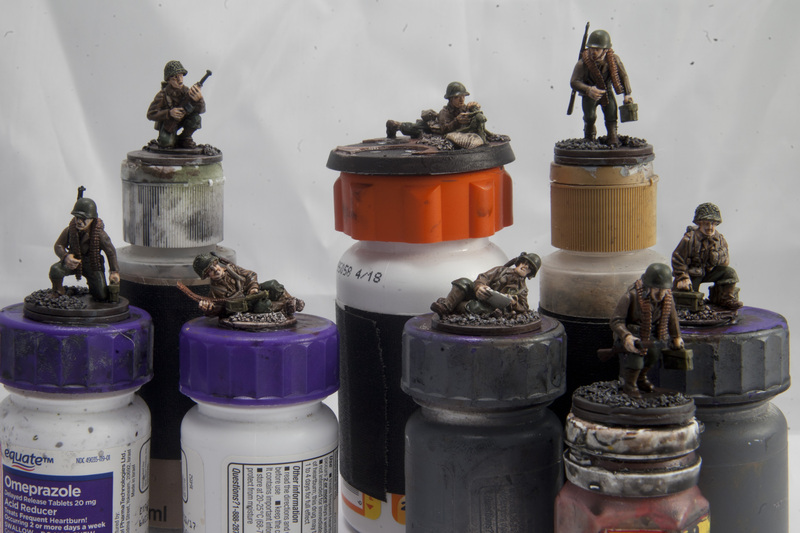 Since this one might be on the board often, I gave it about 30 seconds of high lighting and called it done. I cleared up a bunch of room, and of course filled it back up. 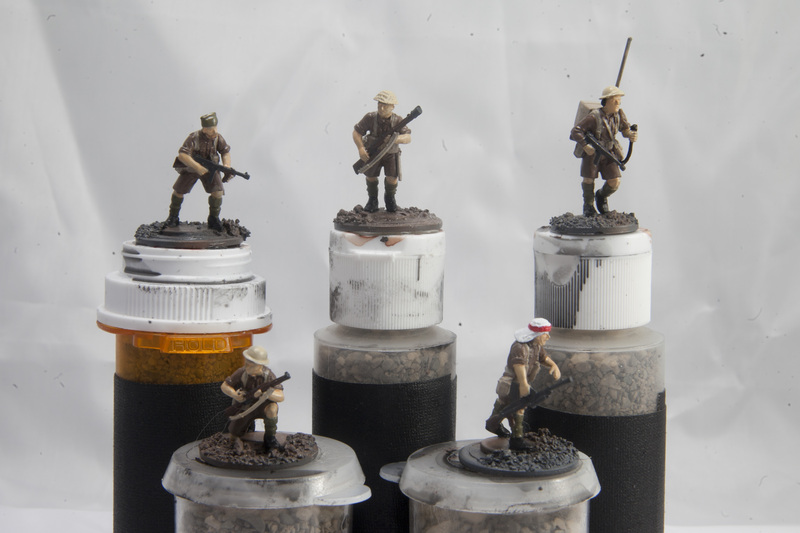 I need to finish up some Gurkha’s which never got highlights and a matte seal so they went back onto the painting desk! 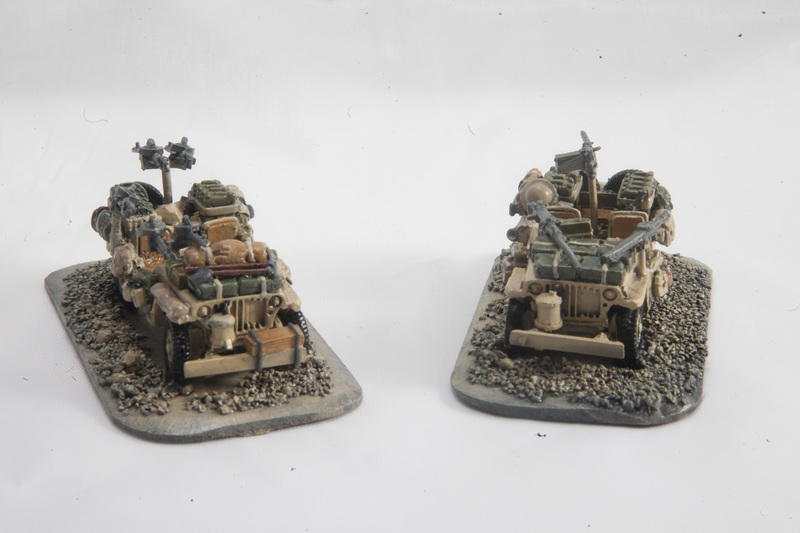 I need a little more practice with the light tent. 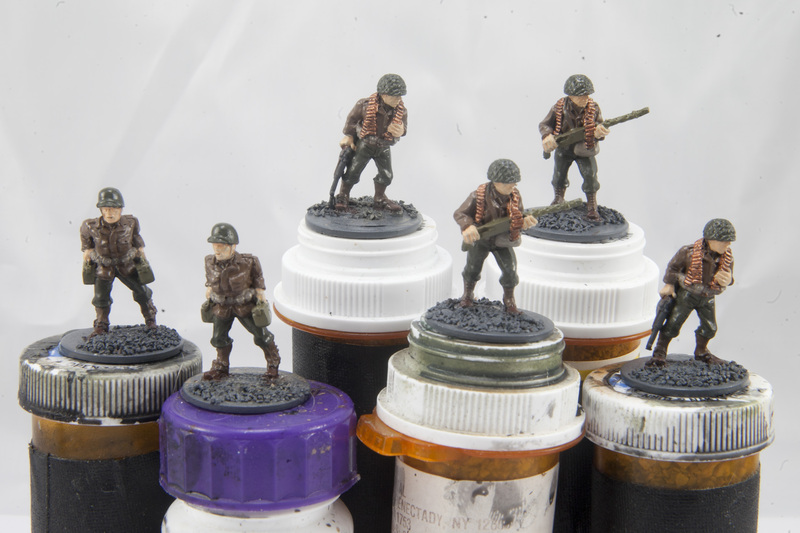 The background needs to be ironed some more, I had hoped that the lights would blow out what creases were still left in there but in order to do that I wind up washing out the minis too much. 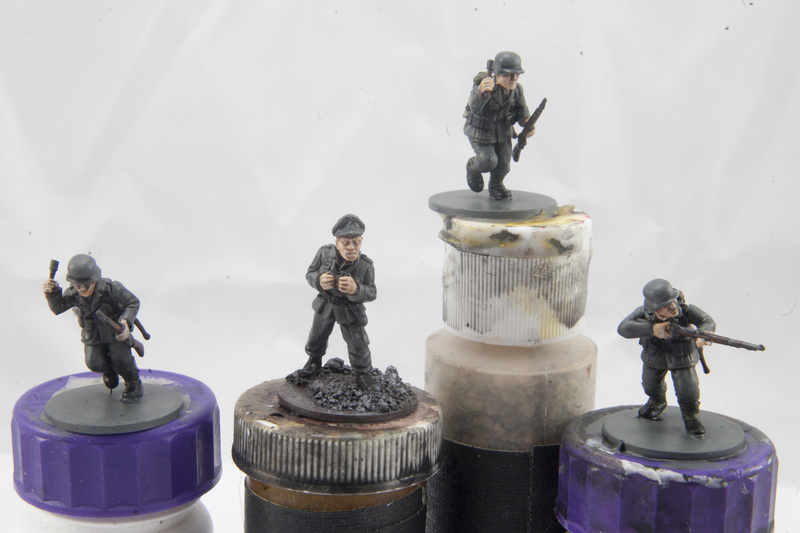 Photographing on a white background also makes any dust on the sensor extremely obvious, and my sensor is filthy! So tomorrow I have to go in and clean all that dirt off of it. 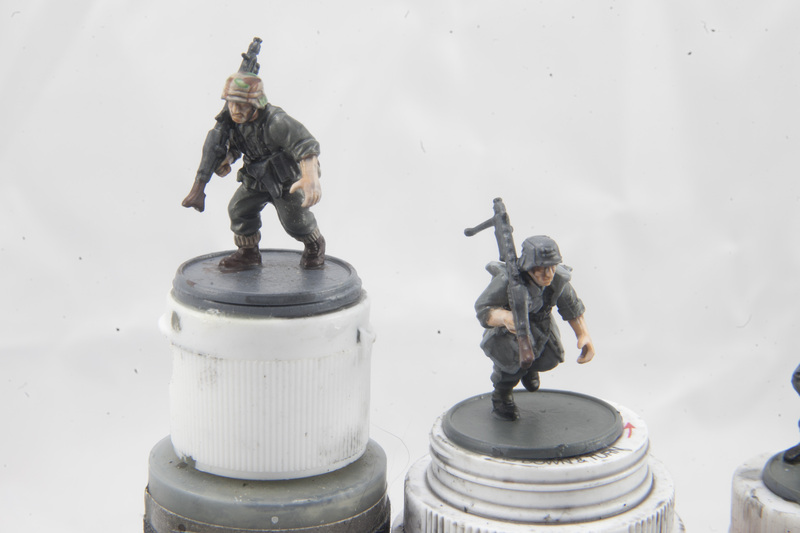 A reader mentioned that the photos were small and sideways, which is odd becuase I rotated them in the WordPress software and they were showing up correct on my monitor. But once I visited on my phone they were all sideways. 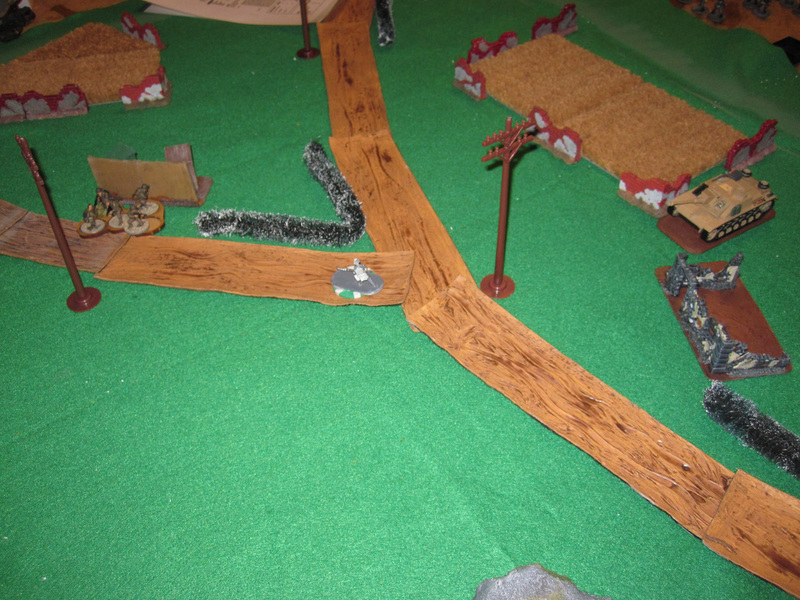 So I also figured out how to make the images clickable and rotated them before uploading. Not a huge learning curve, but its interesting. 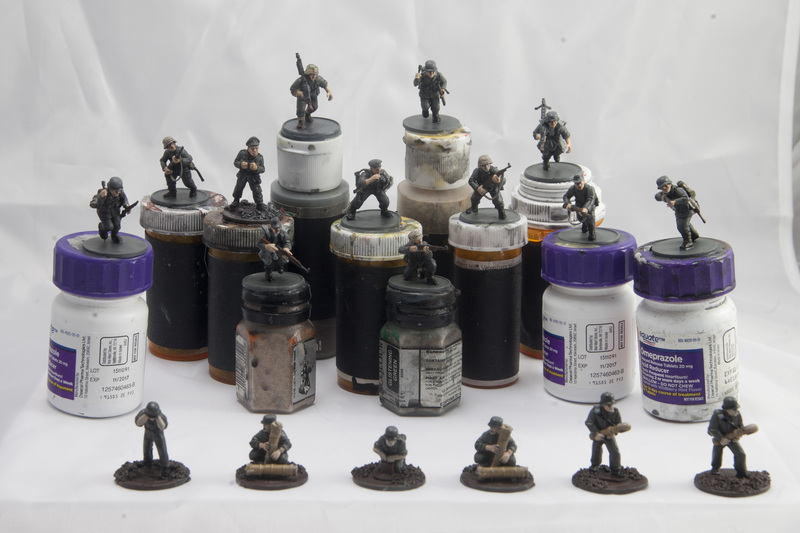 Author addictedtolead_0nuevlPosted on January 9, 2017 January 9, 2017 Categories 28mm, 28mm WWII, Bolt Action, WWIILeave a comment on Cleaning off the painting desk. New toy for photographing minis! So I’m a professional photographer. I do mostly photojournalism and portraits. 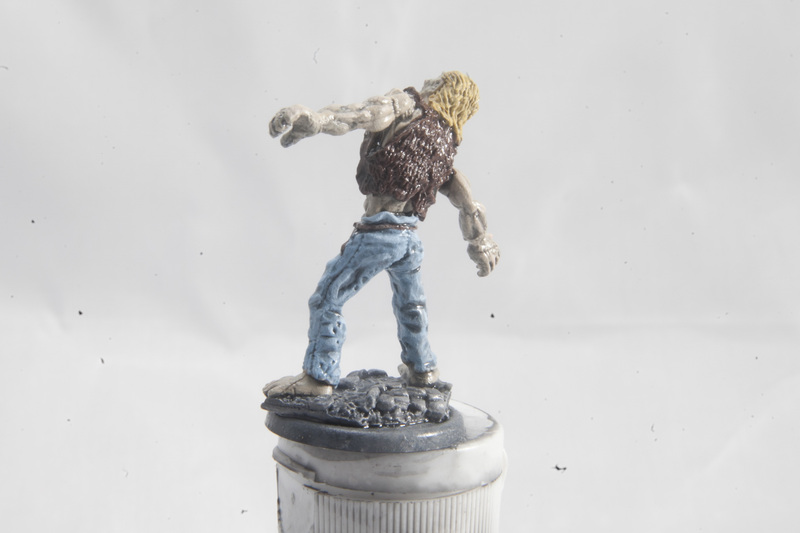 The newspaper industry is in the toilet and I’m retraining to get out, but that’s not the point of this blog… What I don’t do a lot of is product photography and until yesterday I didn’t have a very key tool for doing that, a light tent. I have everything else, flashes, strobes, hot lights, stands, tripods… Closets and cases full of stuff. I wanted to not only start this blog but also sell some stuff I’m never going to use again, so I bit the bullet and spent $20 on this. 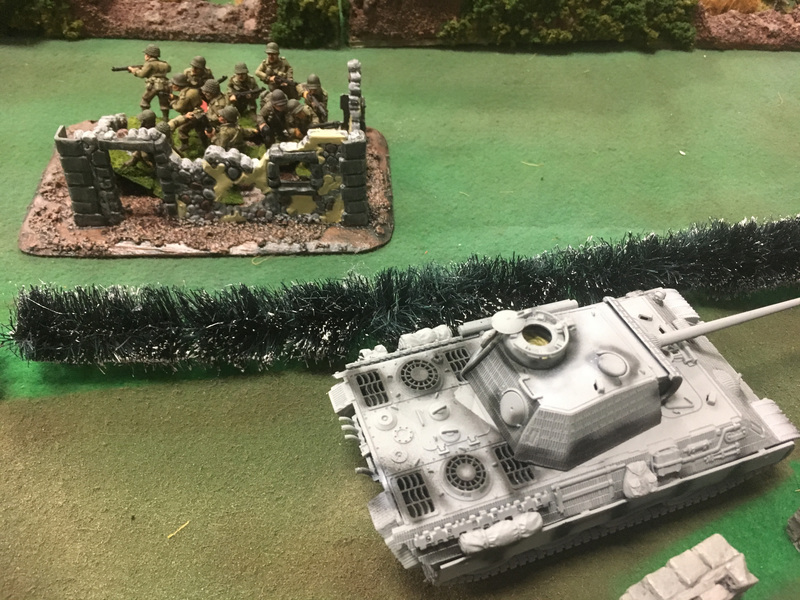 I’m planning on selling the buildings/ruins I made here in a couple weeks after a large Bolt Action event I’m helping to run, so I figured they’d be my first subject! 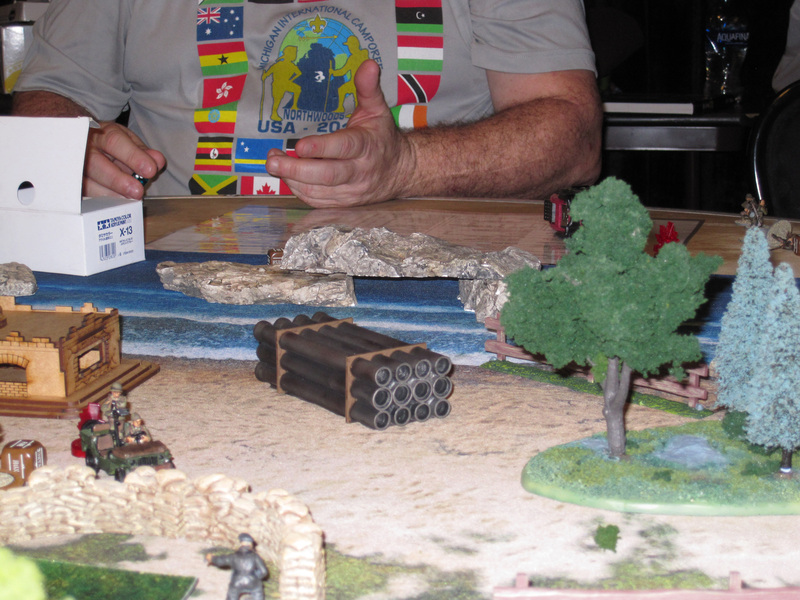 These were all built to represent ruins (hard cover/obstacles) in Bolt Action for a very large multi-player game representing the battle in Achen. I donated a bunch to the club and don’t have the space to store these anymore. 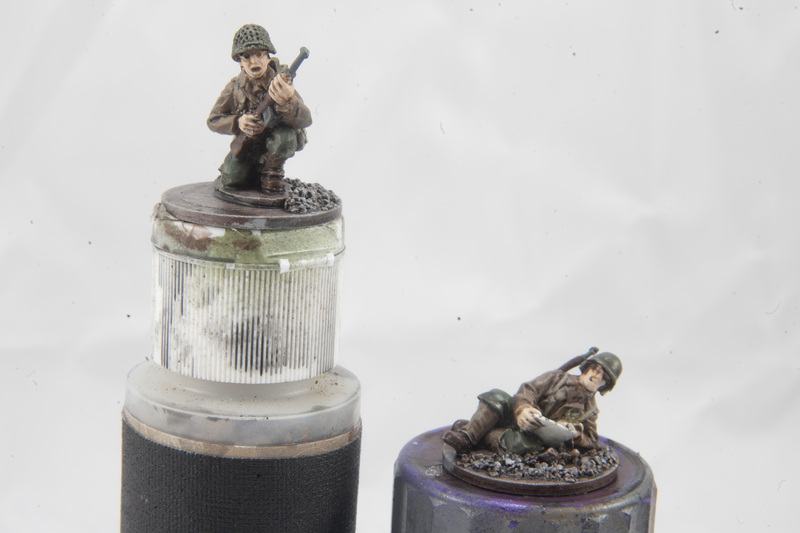 Author addictedtolead_0nuevlPosted on January 6, 2017 Categories 28mm, 28mm WWII, Terrain1 Comment on New toy for photographing minis! 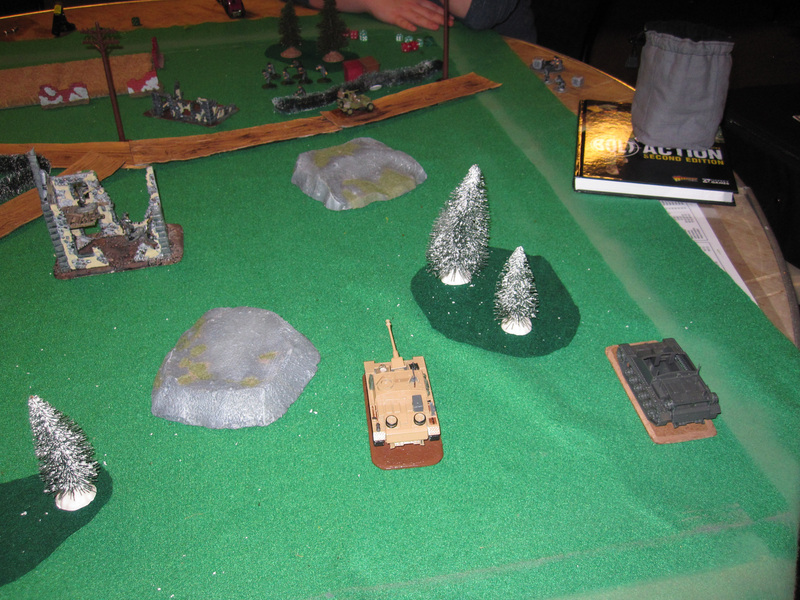 So I started the year off with my first games of Bolt Action 2nd Edition for the escalation league I’m a part of. 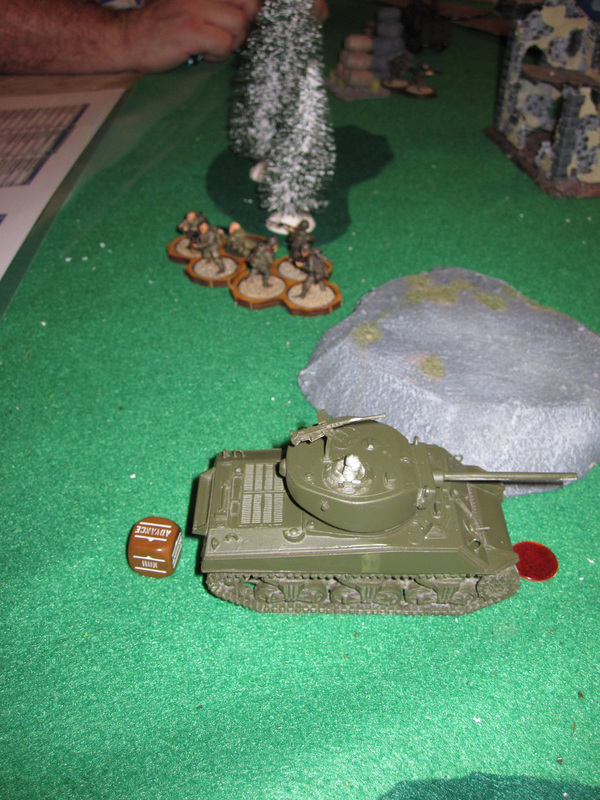 I played a lot of Bolt Action in 2015 and the beginning of 2016, but most of my year was taken up by ‘life’ happening non-stop in 2016. 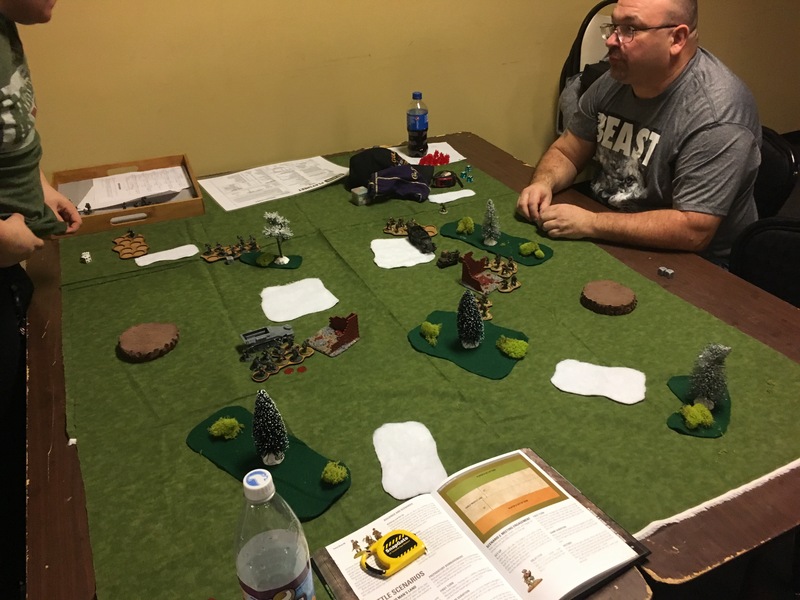 So with people getting their hands on the new rule book and things calming down for 2017 I got together at ToyWiz in Nanuet NY for their monthly Vets Night and got a couple of games in. 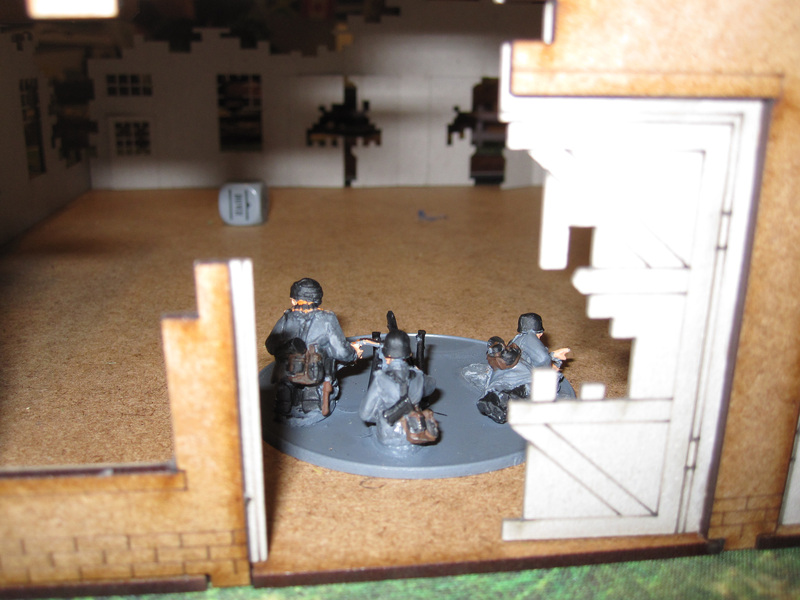 The two mandatory missions for this month’s league at 500 points were Top Secret and Manhunt. 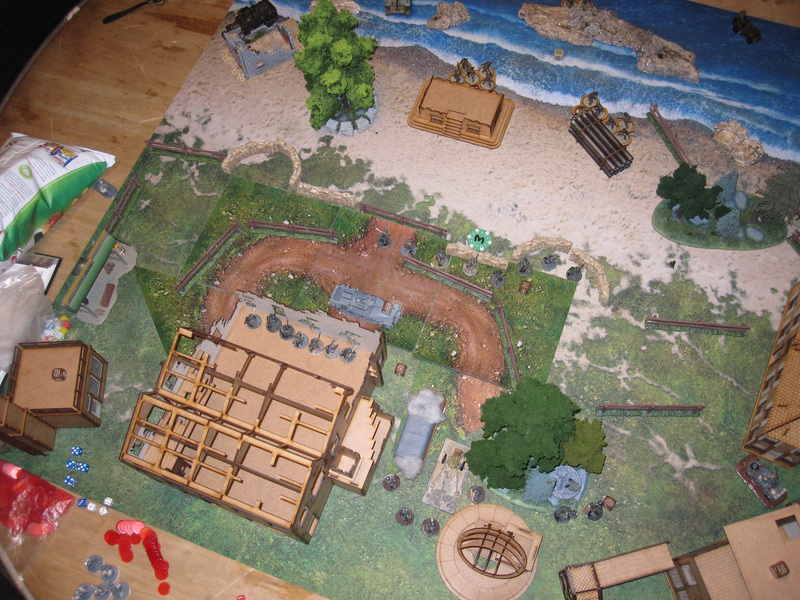 I’m not fond of Top Secret, but I think I had the perfect list for it, a six man squad and a two man LT group in a Stummel giving me that extra move to leap to the center of the board and grab that objective on turn two and use the first activation die of turn 3 to run back behind the Stummel for cover. 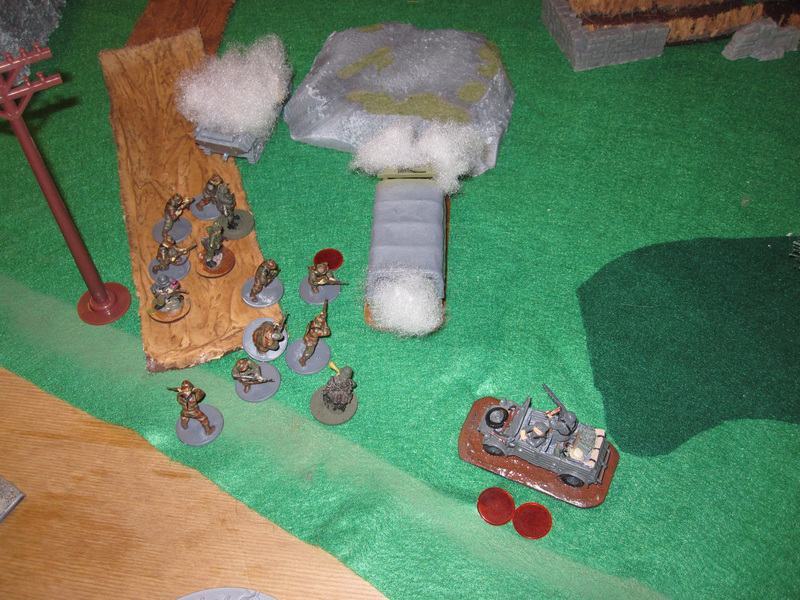 My opponent tried desperately to kill my LT with the objective with withering fire from several squads and a machine gun. 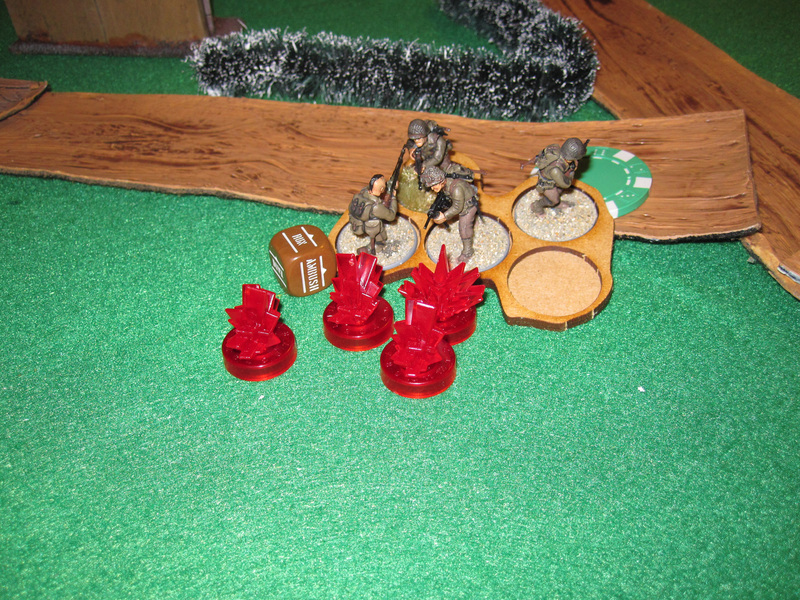 His fire was accurate on turns one and two, decimating a squad and killing the LT’s assistant. 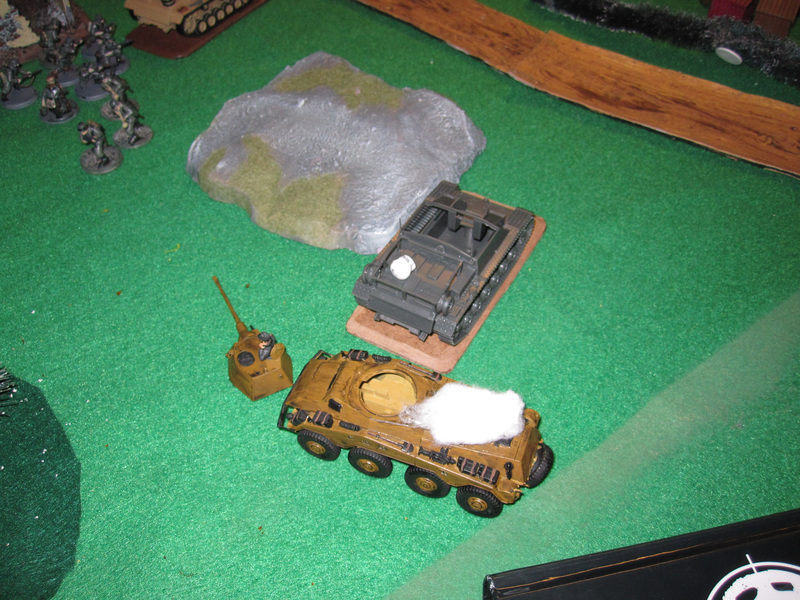 But once I had the objecting Lt Hans turned into Usain Bolt and was bulletproof! Turn 5 he ran off the board. 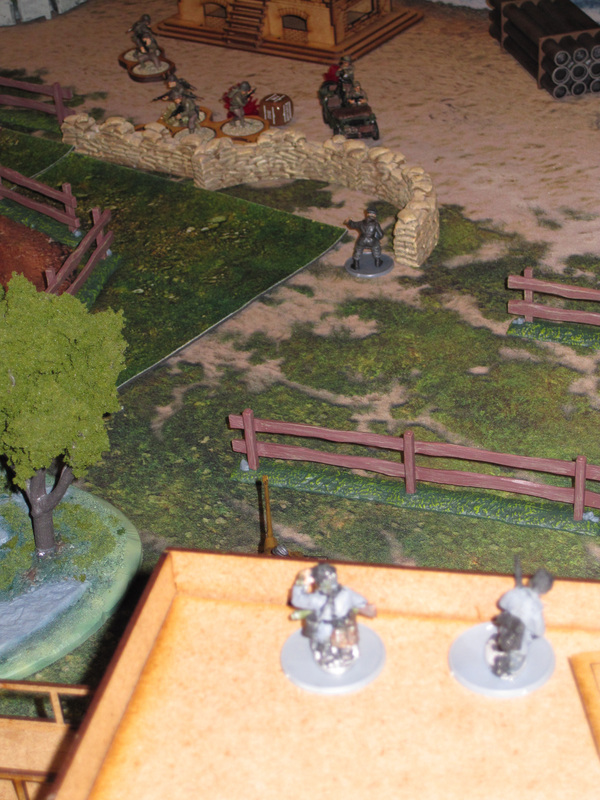 I managed to get his sniper, since that is the bonus objective for this round of the league. 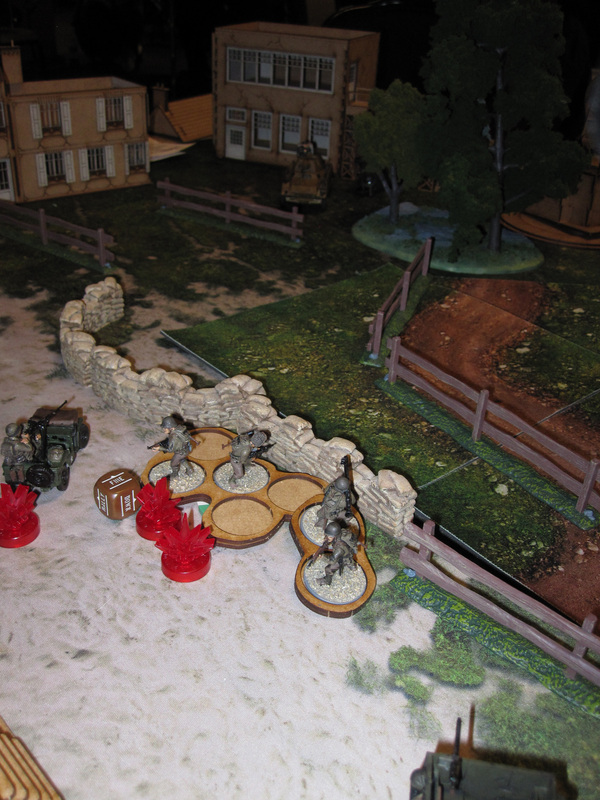 Game two was Manhunt against the Soviet horde! 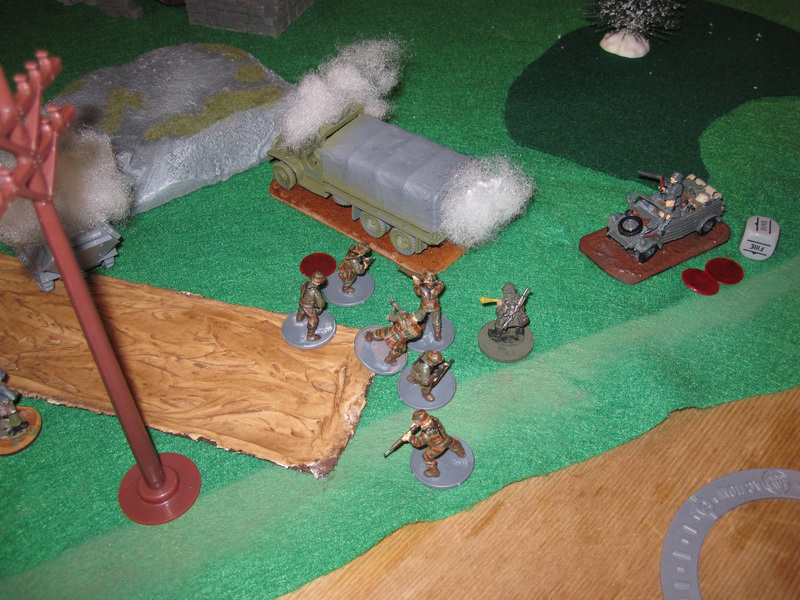 I was on the offense and had some bad luck on the preparatory bombardment. 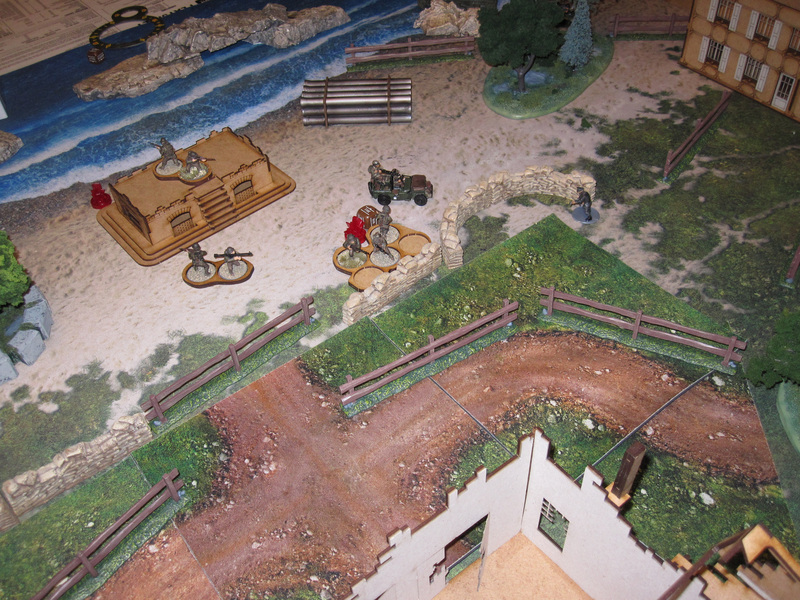 The objective is to capture the defender’s leader by assaulting and ‘killing’ him in close combat. 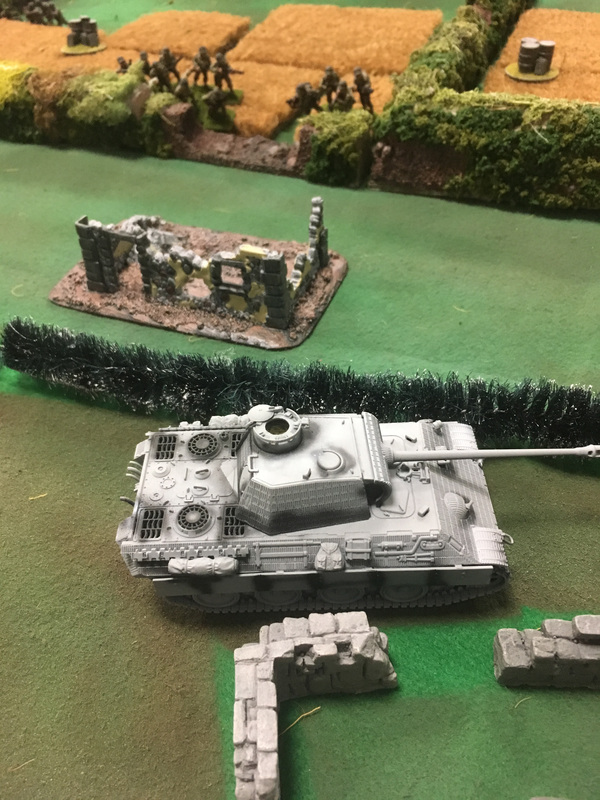 Well my preparatory bombardment nailing him with a shell, killing him instantly and giving me a draw result before the game started! If we were a little more observant we would have read the part where it modifies the prep bombardment roll for the officer so he can’t be killed, but I guess we failed that perception roll! 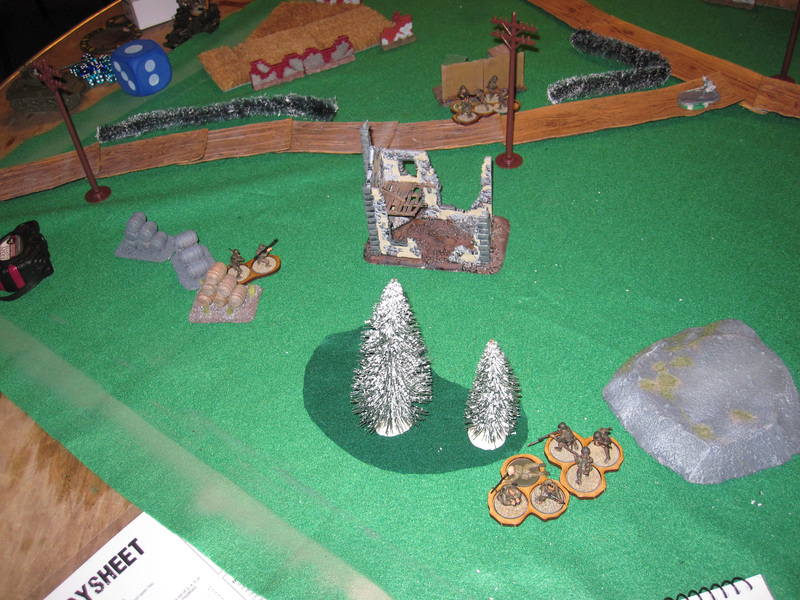 So I proceeded to fight for the bonus objective points and get more of my units to the center of the board than his. 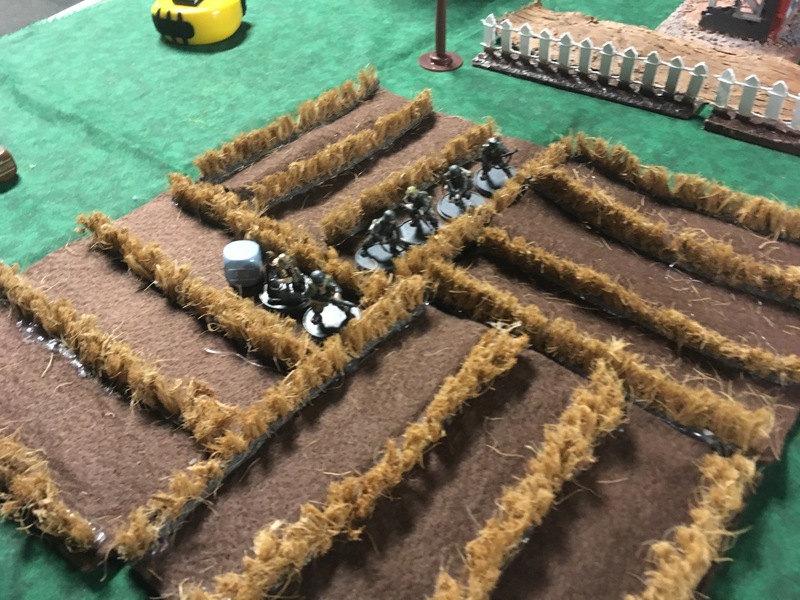 Considering he started off with more then I did and already had 4 of his 8 units there during deployment against my 6 units total, it looked like an up-hill battle. 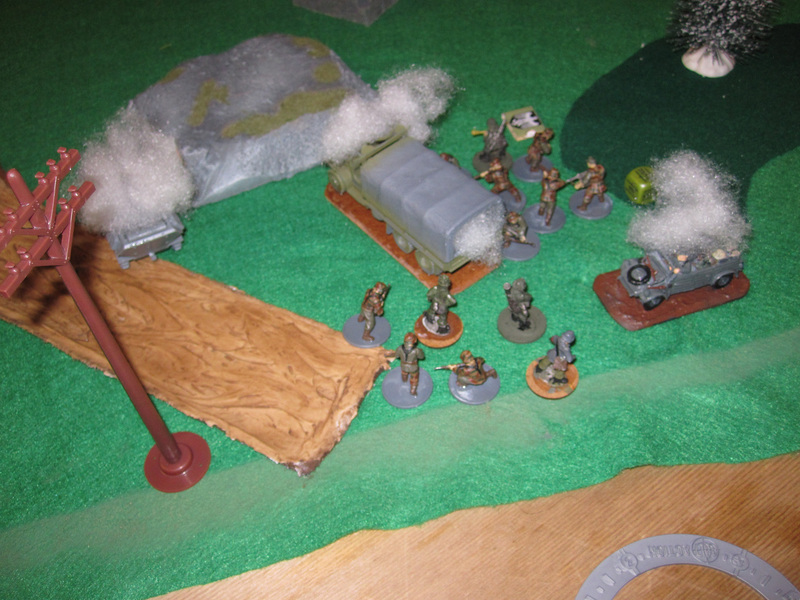 One unit of conscripts melted away on turn 1 to withering fire as the Stummel and a unit of engineers walked up to point blank range. 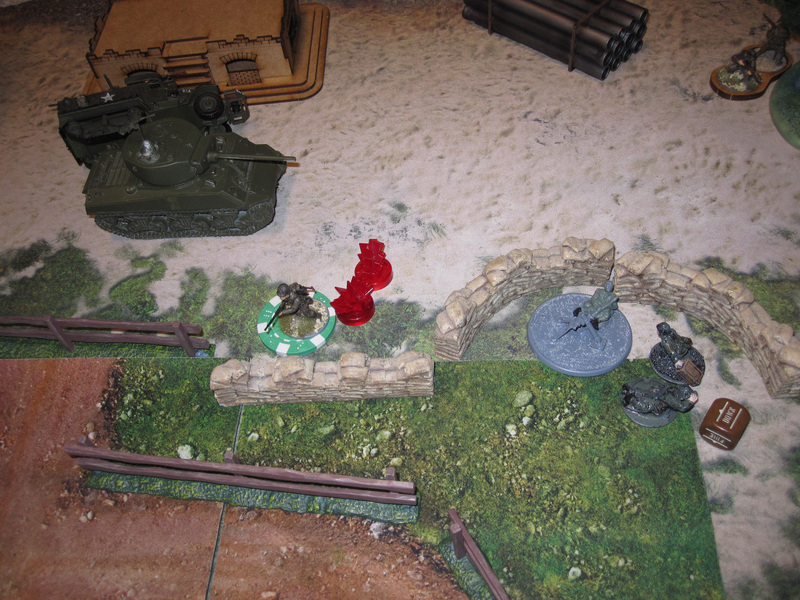 Another unit of conscripts with AT grenades came dangerously close to my Stummel, but couldn’t attack it on the turn it came on. 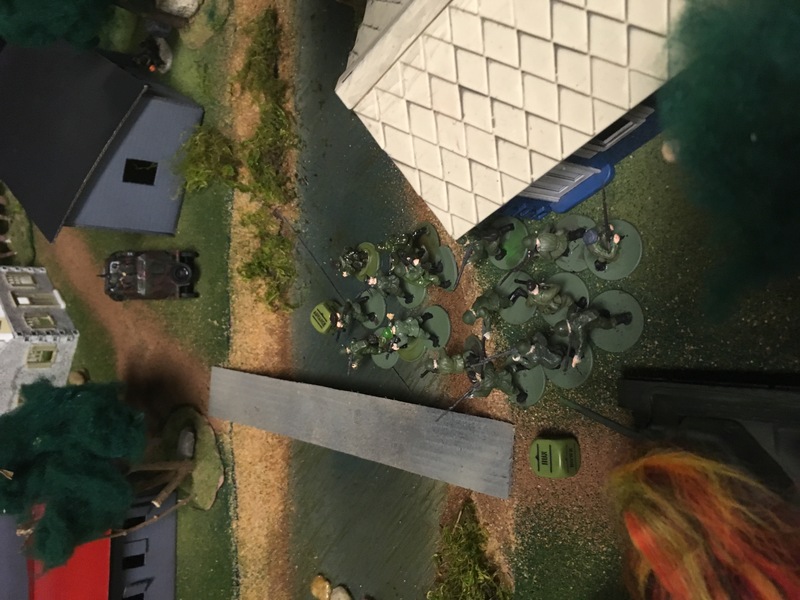 Lucky dice draws on the next turn had me sneak a squad of men behind the unit and force a morale check from casualties before it could activate. 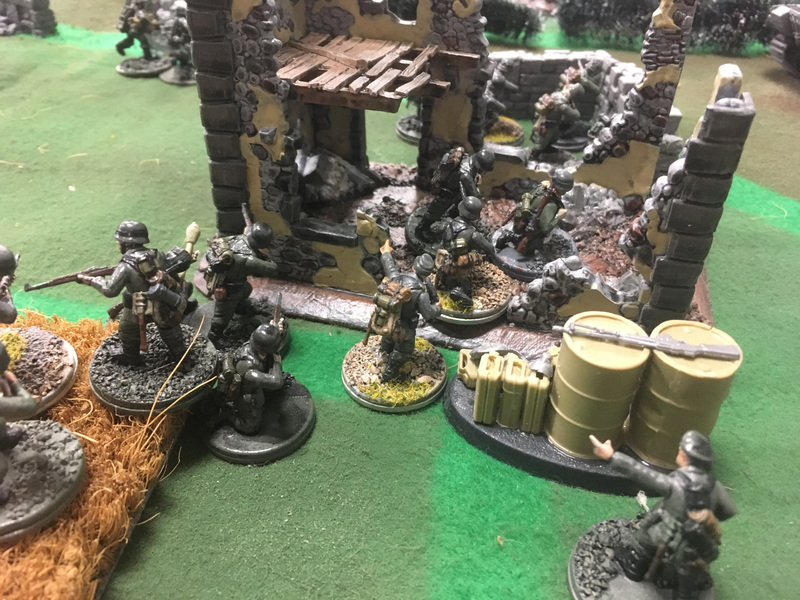 His Siberian veterans snuck in and SMG’d my LT to death and the rest of the game bogged down with me trying to dig the last units out of cover with withering point blank fire into the ruins they were ducked into. 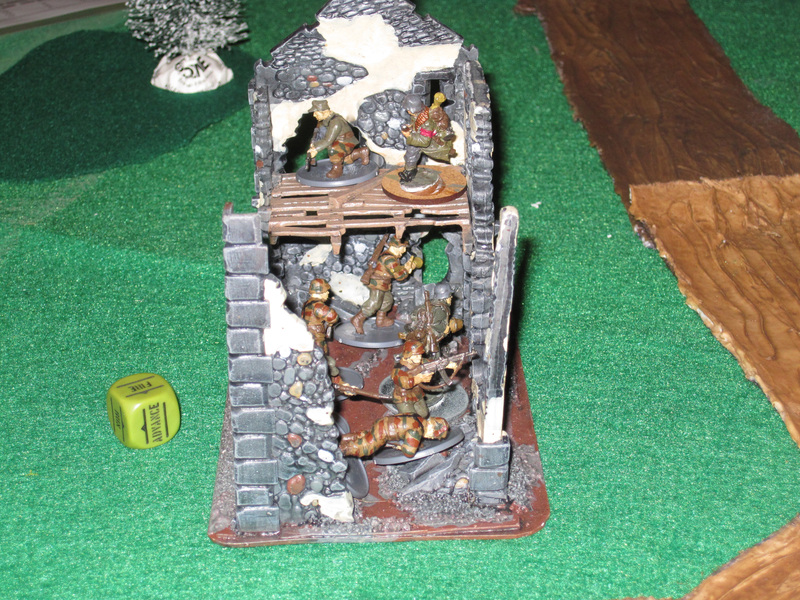 In the end a desperate close combat charge wiped them from the ruined building. 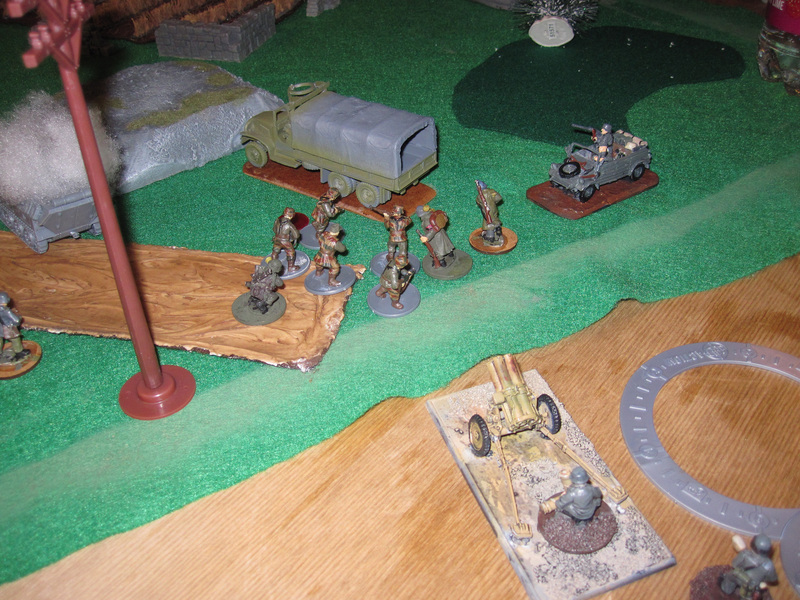 His sniper fell to a Kubelwagon driving right up to him and machine-gunning him to death. 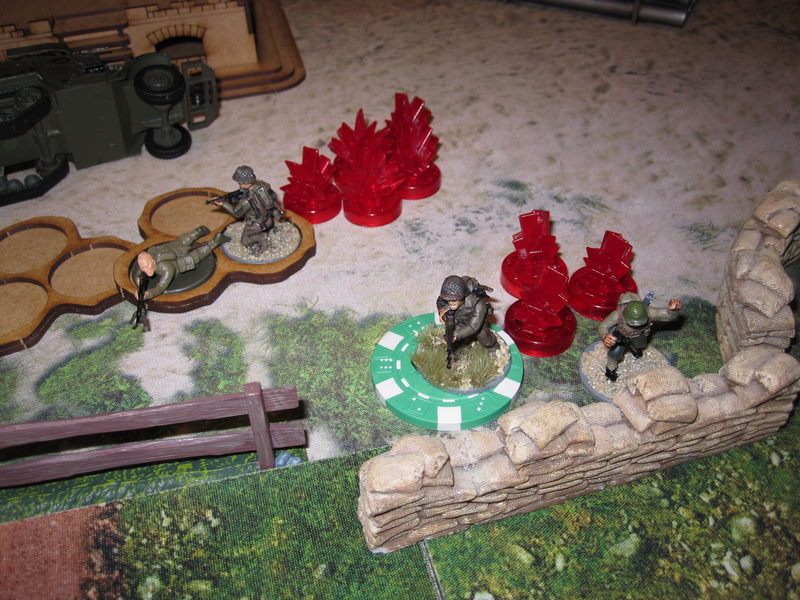 One win, one draw, two bonus objectives and two dead snipers for the tally at the end of the month! Not too bad for my first games in almost six months! 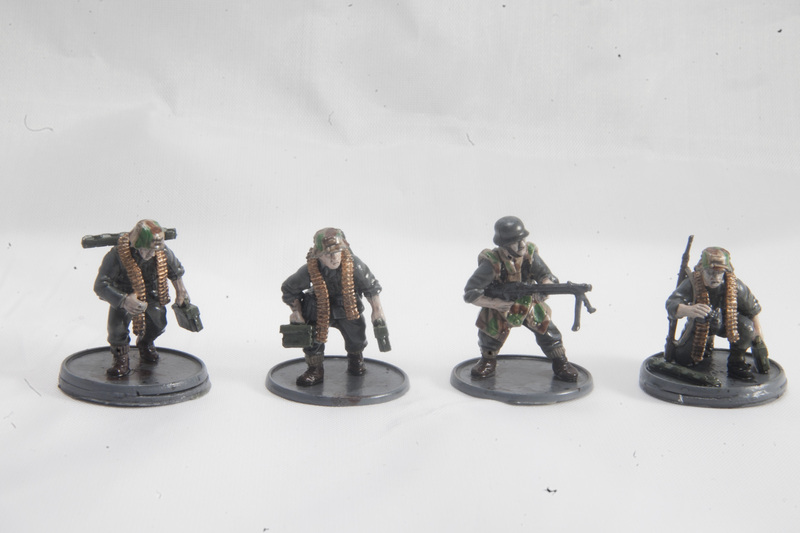 Time to get some more paint on these guys so there is less bare metal for the next games! 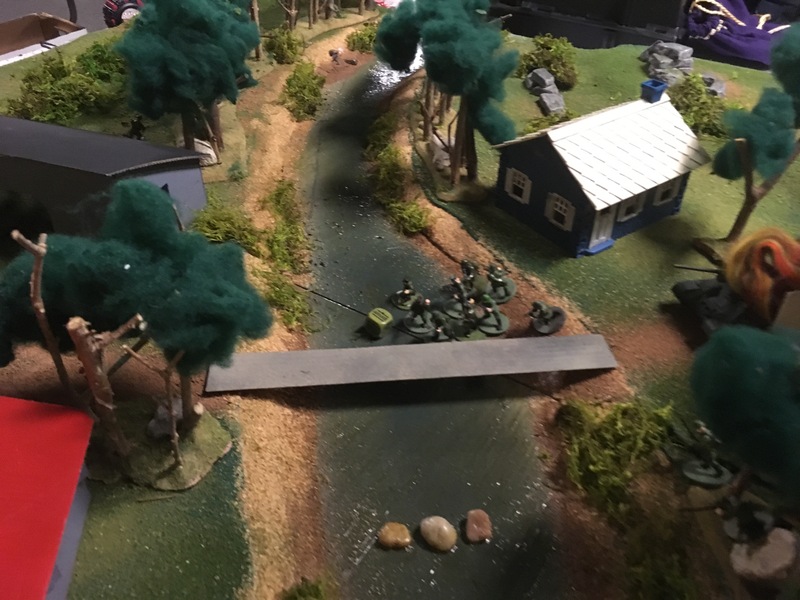 Author addictedtolead_0nuevlPosted on January 6, 2017 Categories 28mm WWII, Bolt Action1 Comment on First games of 2017!